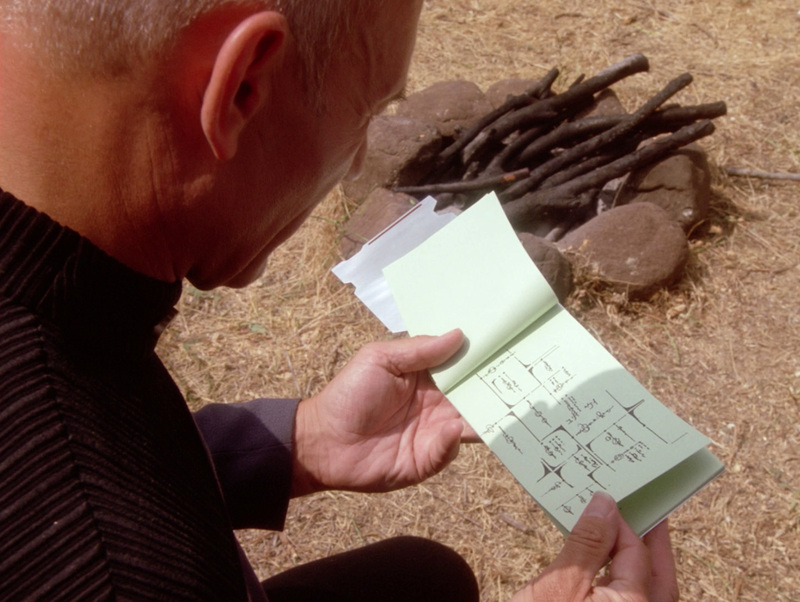 Ex Astris Scientia - Observations in TNG: "Darmok"
Here are some observations about sets, props and visual effects in TNG: "Darmok" without a specific theme, and a comparison of the original TV release (TNG) with the remastered episode (TNG-R). 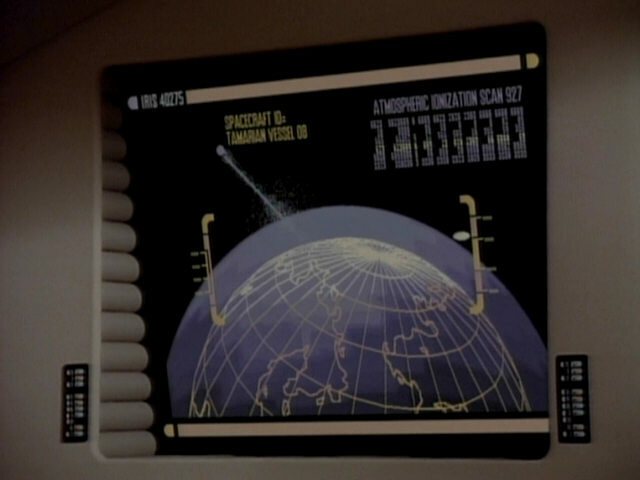 A schematic of the Tamarian vessel can be seen on the observation lounge monitor. 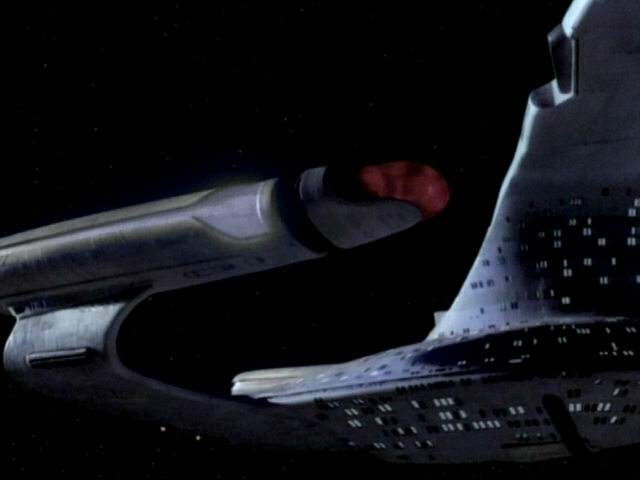 The registry of the SS Shiku Maru, the ship that made first contact with the Tamarians, could be "NDT-38864", "NDT-30064" or a similar permutation. 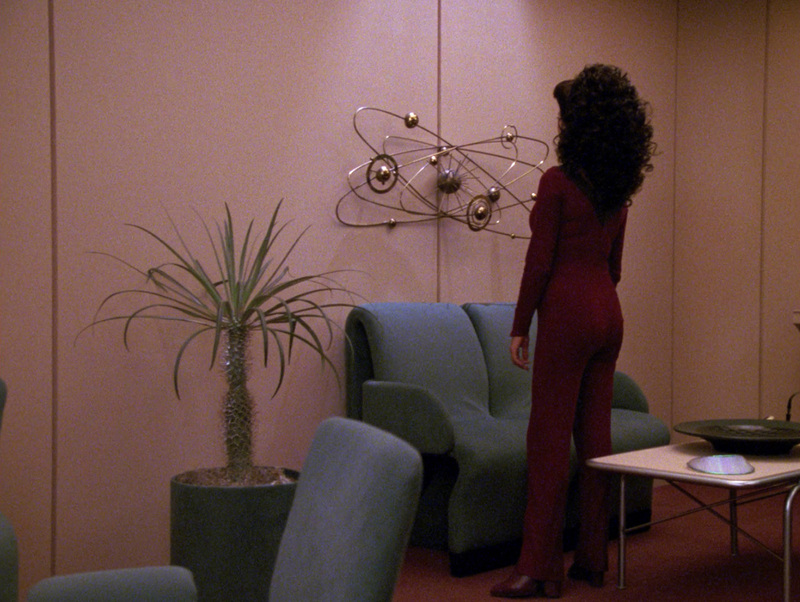 The new back wall of the observation lounge, no longer featuring golden starship models, can be glimpsed in this shot. 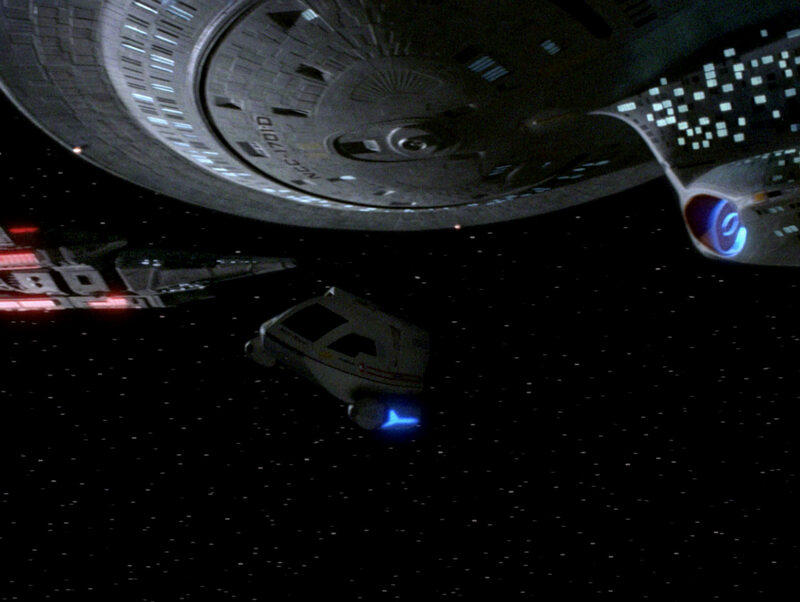 The USS Enterprise-D faces the Tamarian vessel in orbit of El-Adrel IV. 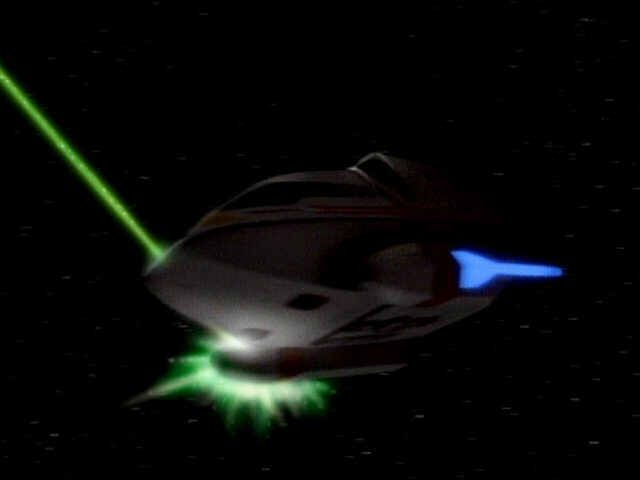 The model is a redress of the Talarian observation craft, created for "Suddenly Human". 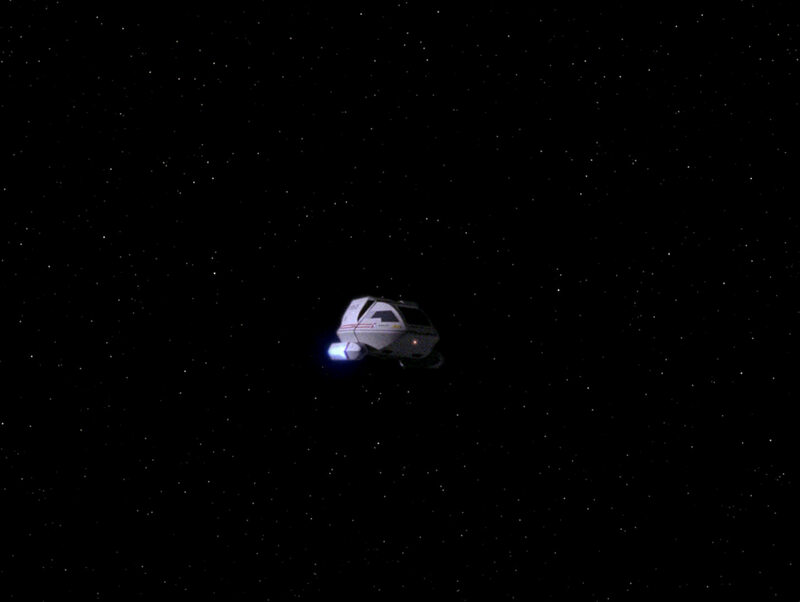 Redresses of the Talarian Observation Craft The ships in full HD glory. 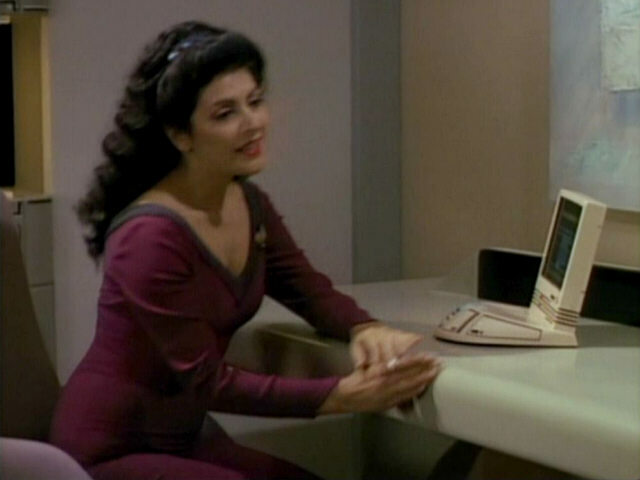 The bridge of the Tamarian vessel features several consoles seen in previous episodes. 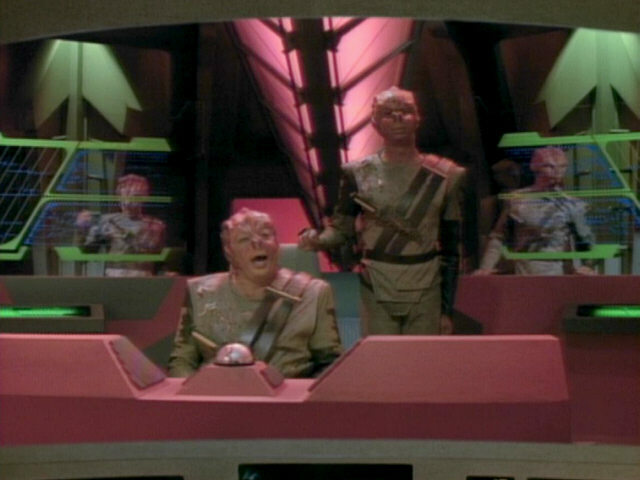 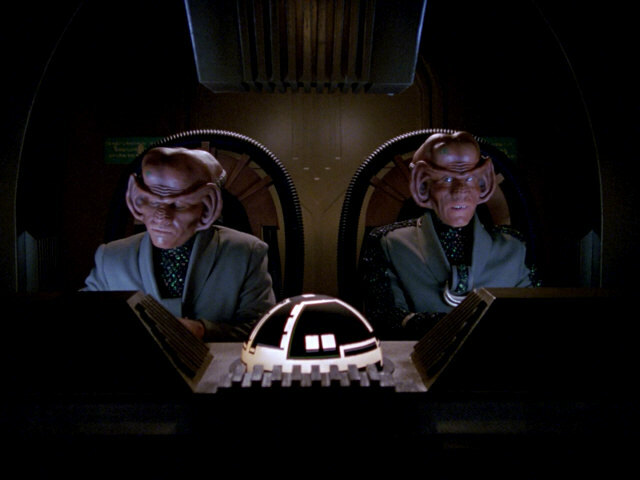 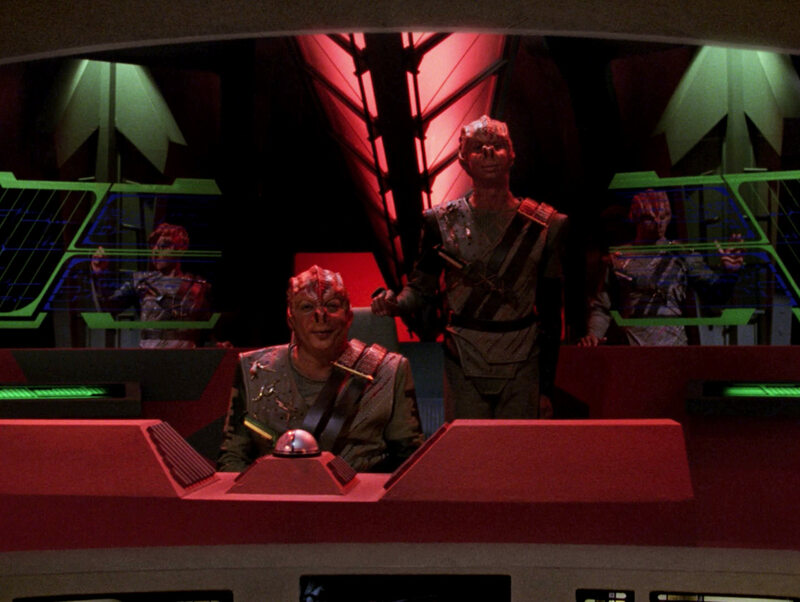 The central console in front of Captain Dathon was originally created for the Ferengi shuttlepod seen in "The Price". 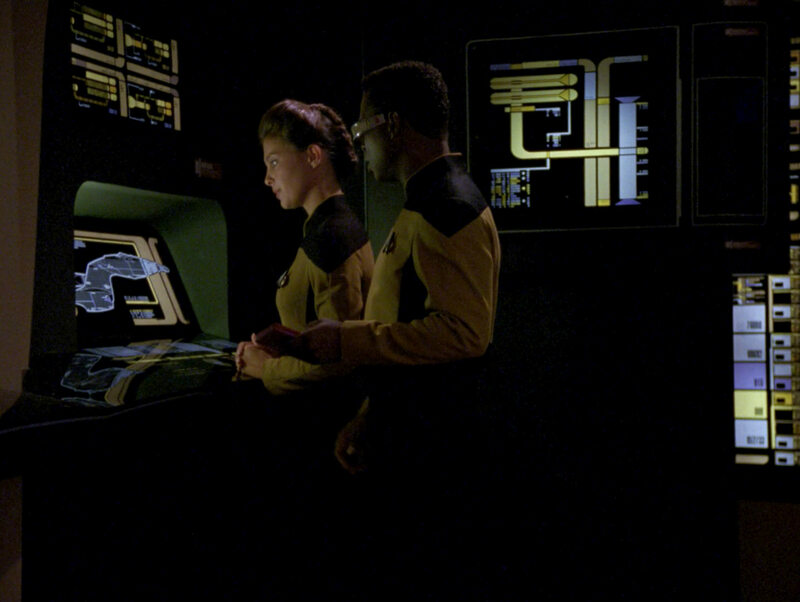 It was later often re-used as a Romulan console in episodes such as "The Defector" and "Future Imperfect". 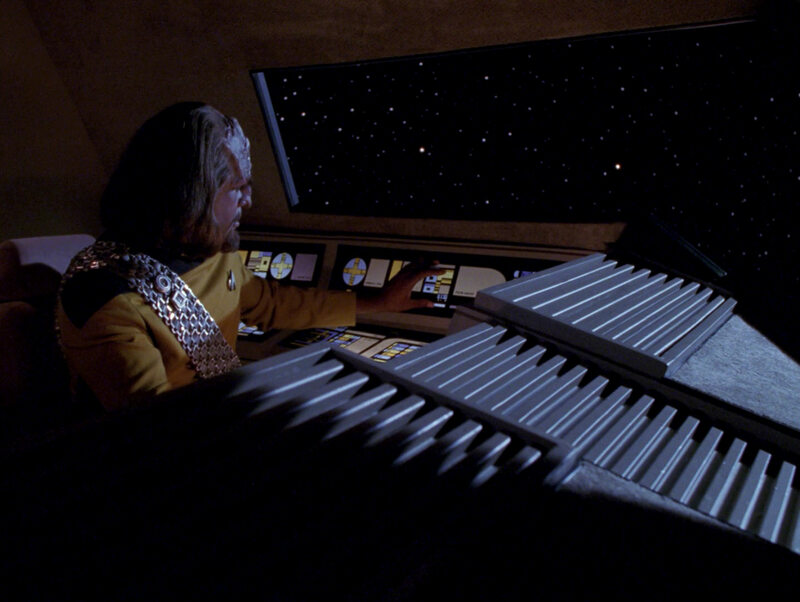 The glass consoles to the left and right of Dathon were first seen in the lab on Bre'el IV in "Déjà Q". 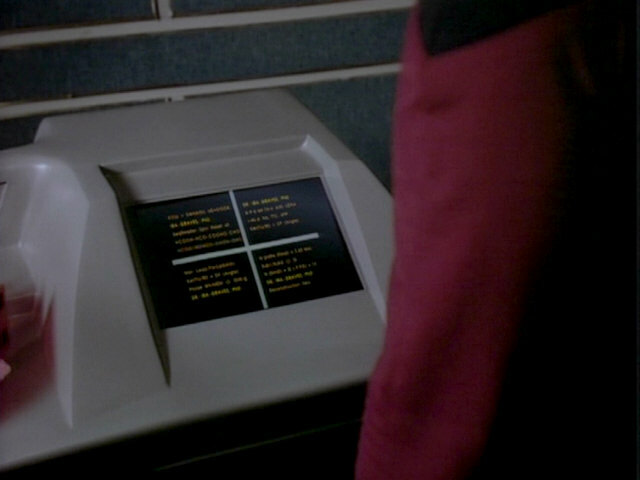 The consoles appear again this season, in "A Matter of Time", with unchanged green interfaces. 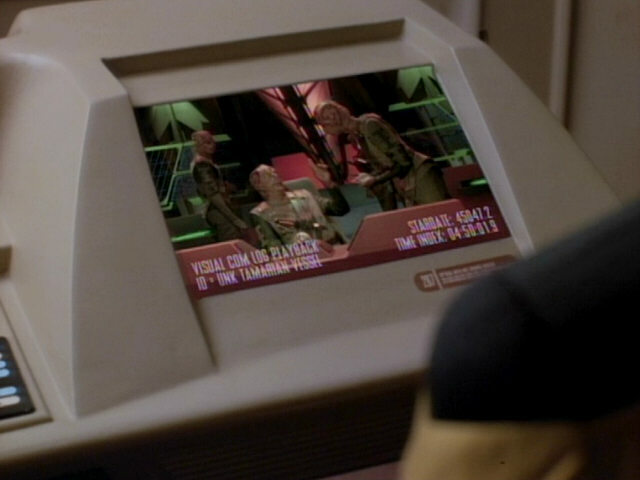 "Déjà Q" The Tamarian bridge in TNG-R. 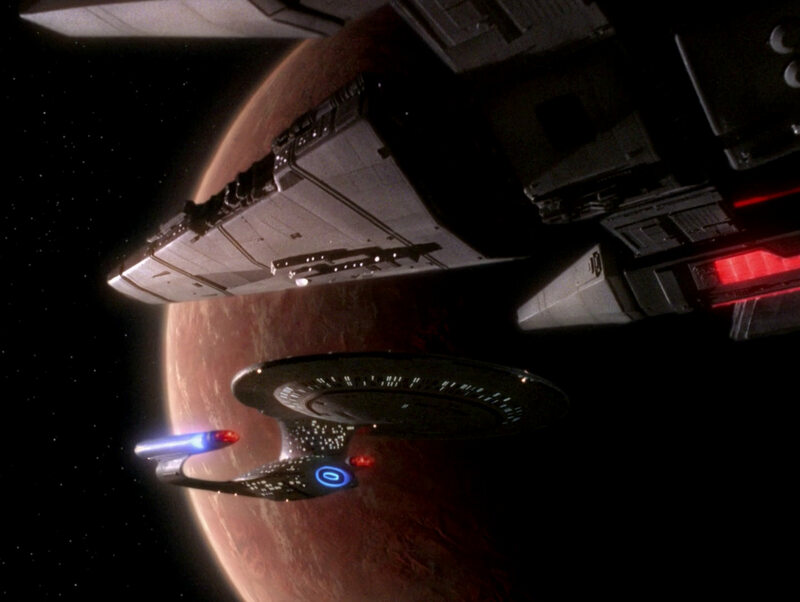 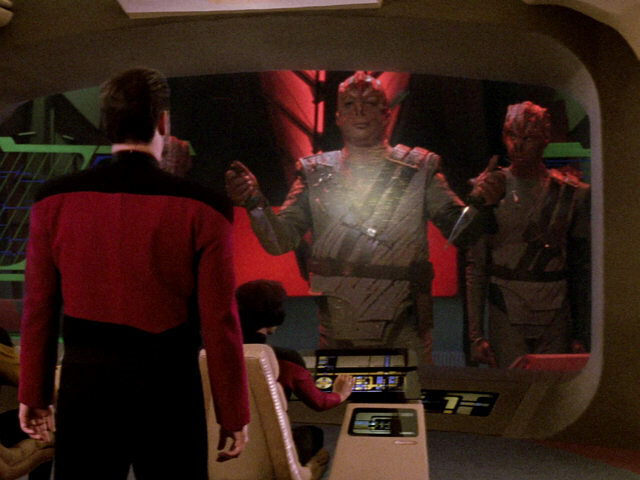 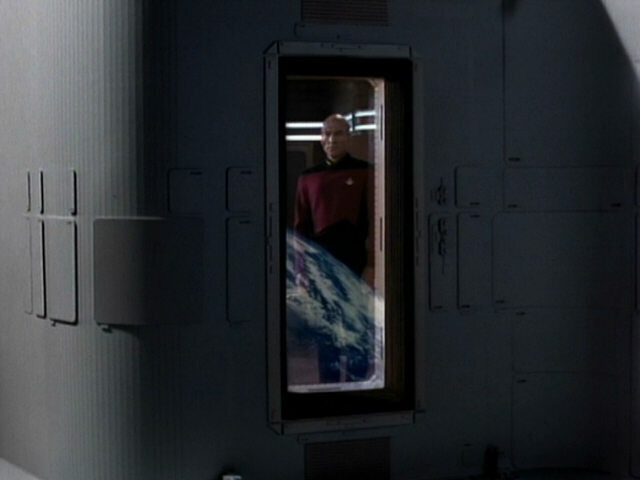 The shot of Picard and Dathon being beamed away was filmed anamorphically, the camera movement from the left to the right was achieved using the technique of "pan & scan". 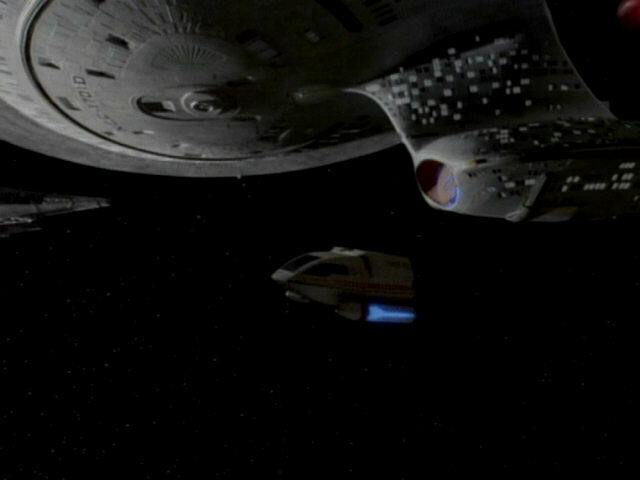 A similar shot appears later in the episode. 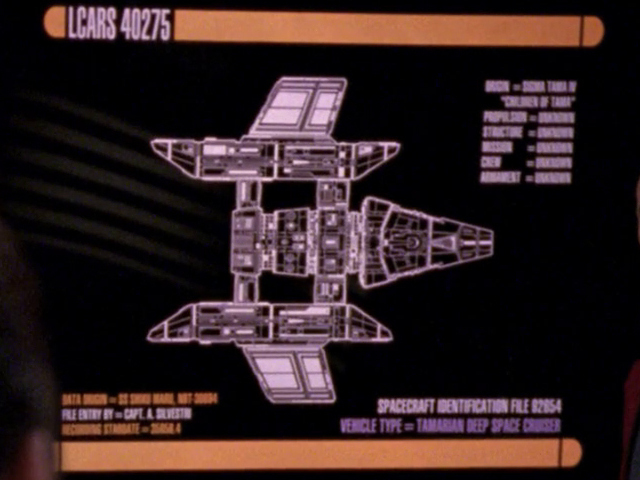 A good look at the Tamarian ship as it appears on the bridge viewscreen. 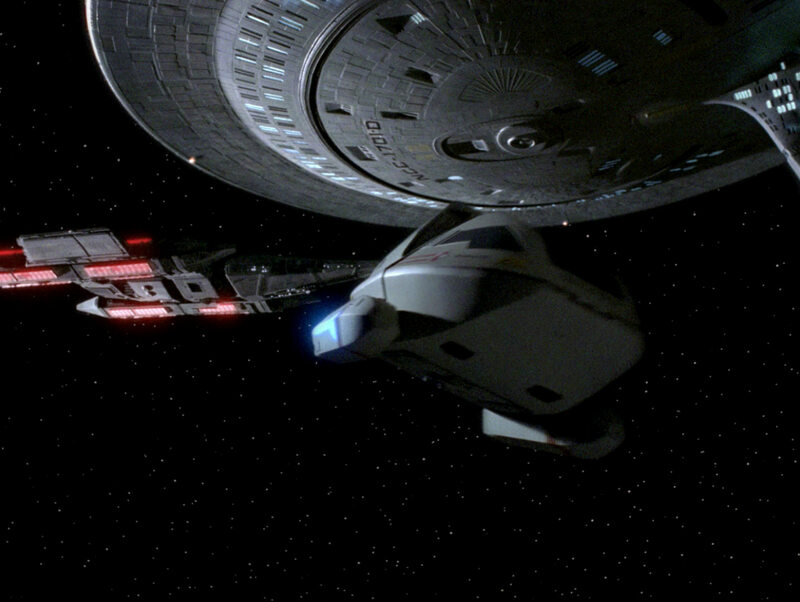 Another great HD shot of the Tamarian ship. 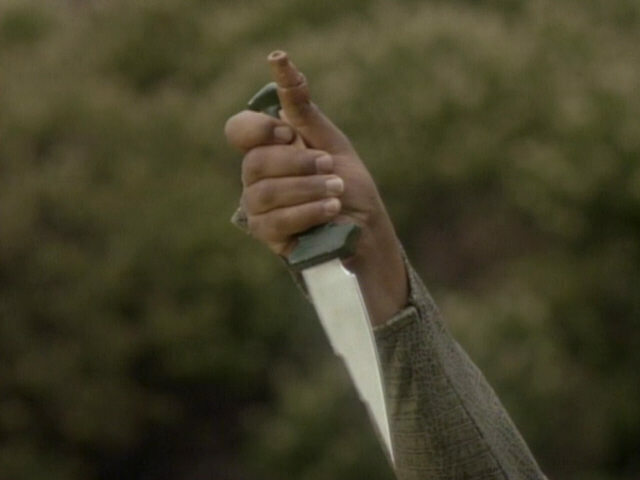 This screenshot shows the characteristic Tamarian thumb and Dathon's knife. 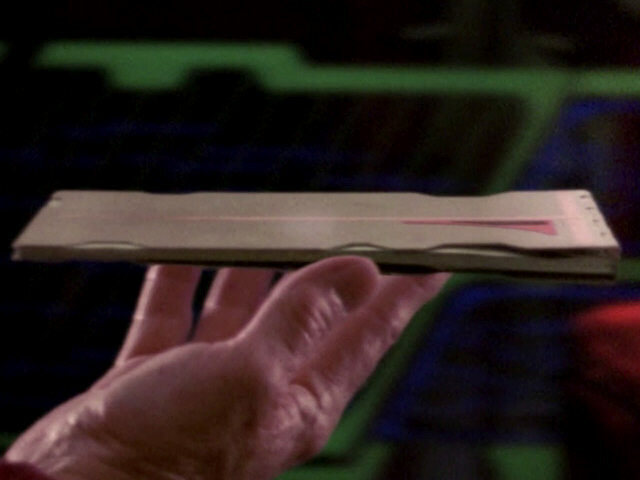 In Alien Hands Captain Dathon and his dagger in HD. 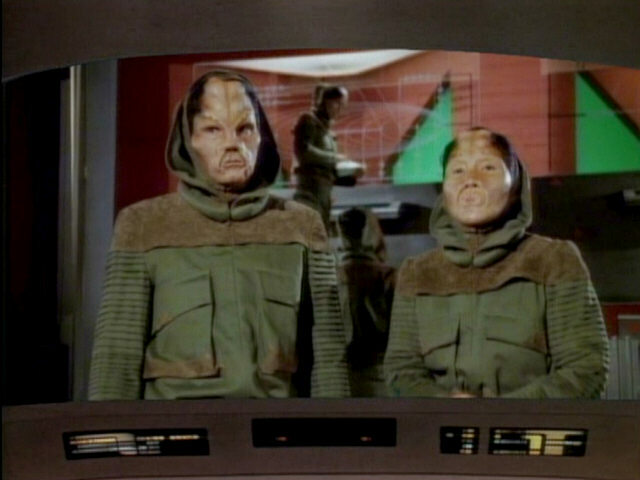 A good look at the Tamarian make-up. 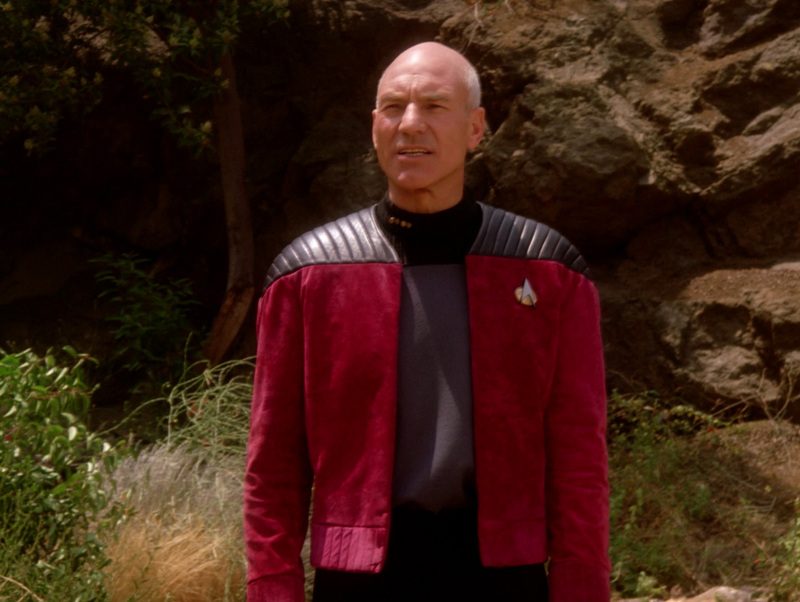 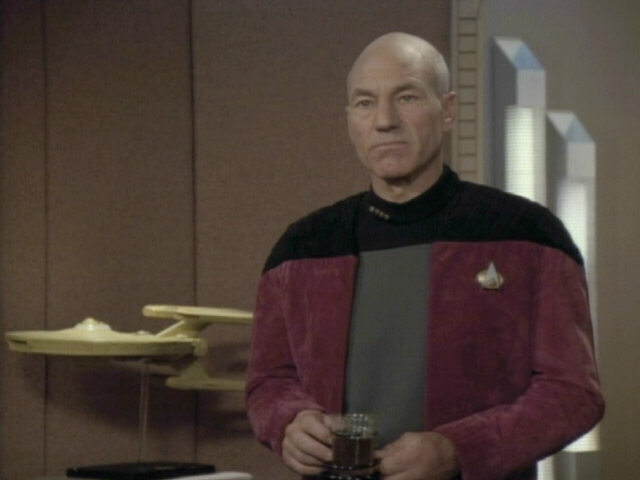 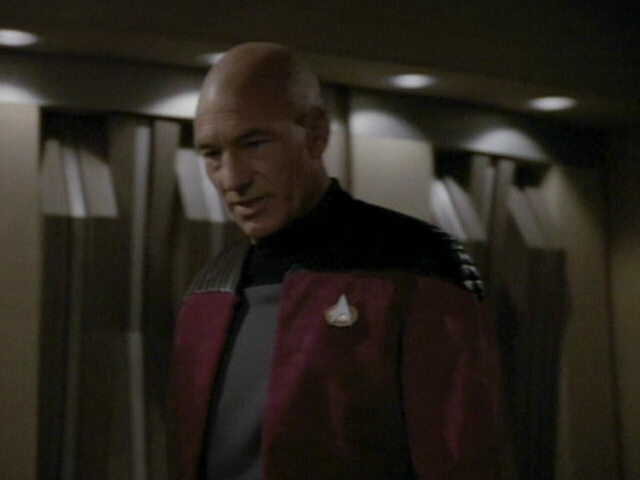 Picard's two-piece captain's uniform variant appears for the first time in this episode. 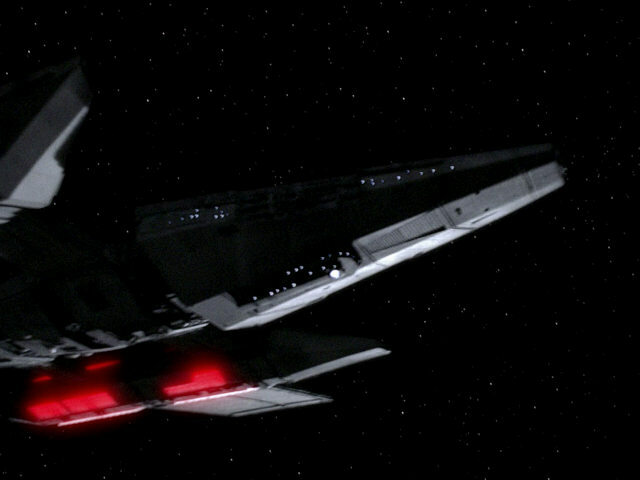 Only here, the black part is made from a leather-like material, though. 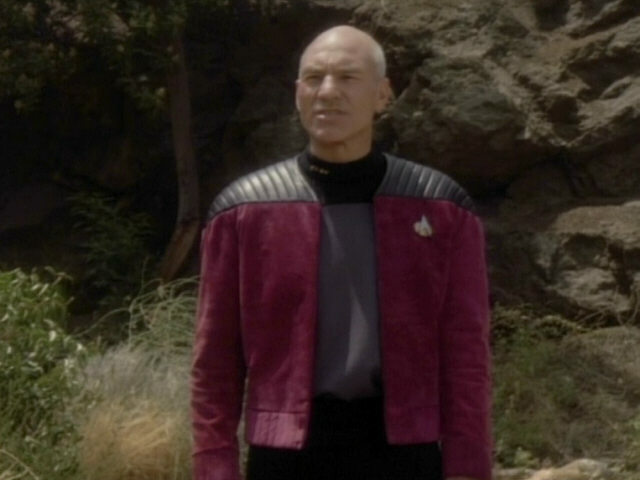 When it reappears in the very next episode, "Ensign Ro", the material the top part of the jacket is made from has changed. 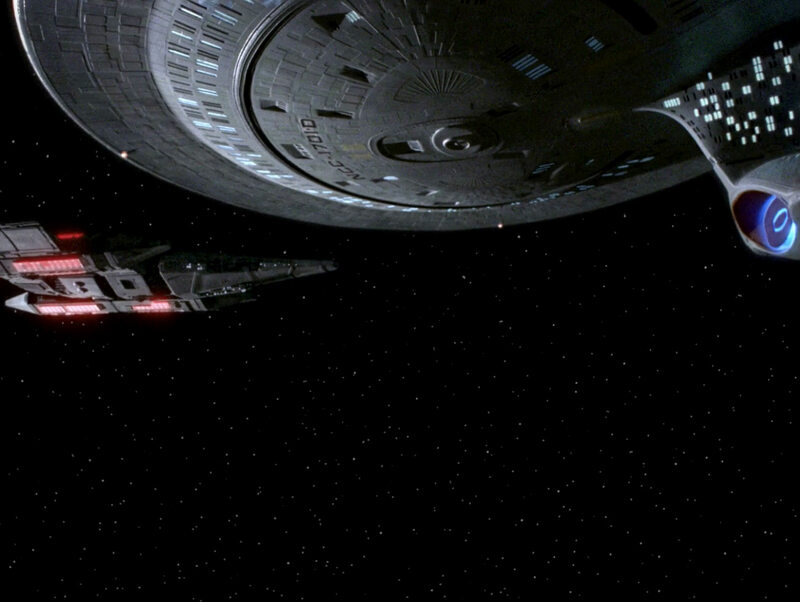 "Unification I" We can see even better in HD that the black shoulder part is made of leather. 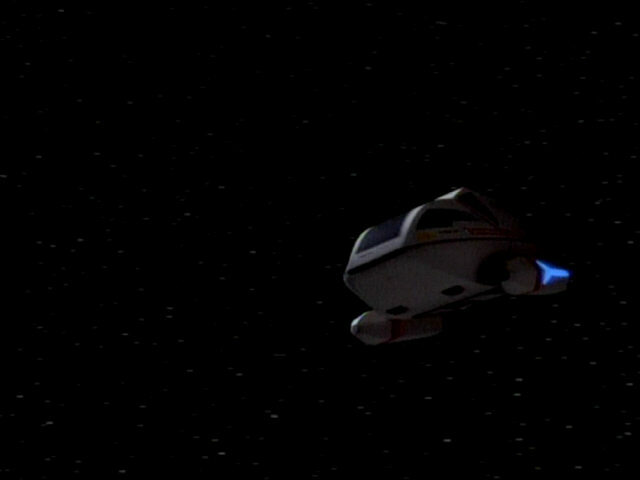 The new Type-6 shuttlecraft appears for the first time in this episode. 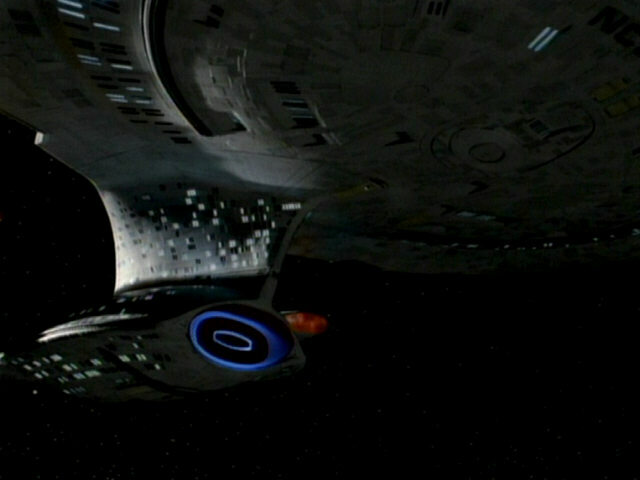 The footage of the USS Enterprise-D was also newly filmed for this episode. 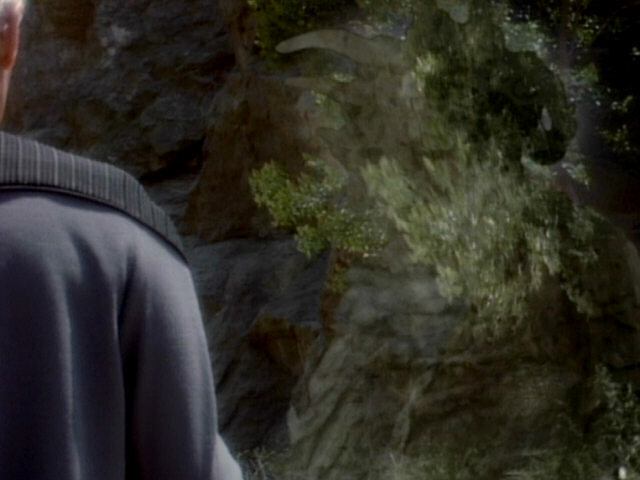 The scene in HD. 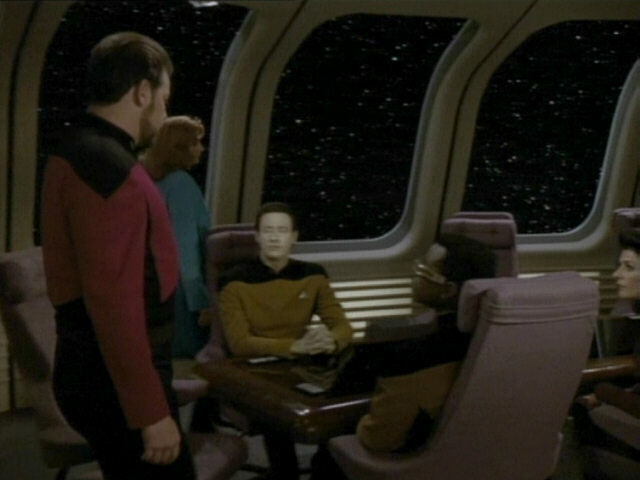 The interior of the Type-6 shuttle. 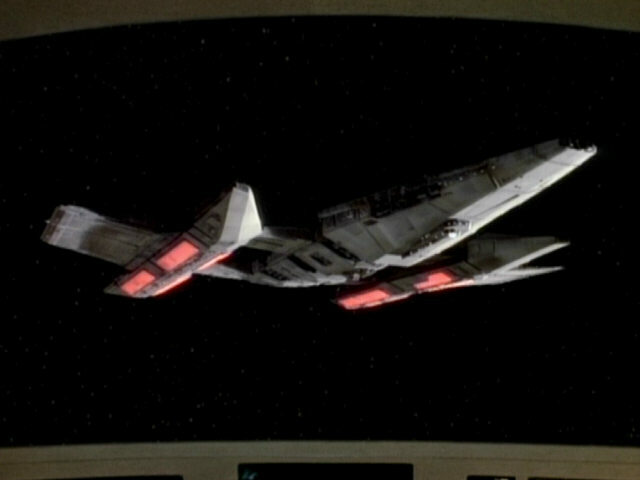 Only the front part, including the cockpit, is seen in this episode. The aft section was added (and modified) in later episodes. The interior of the shuttle in HD. 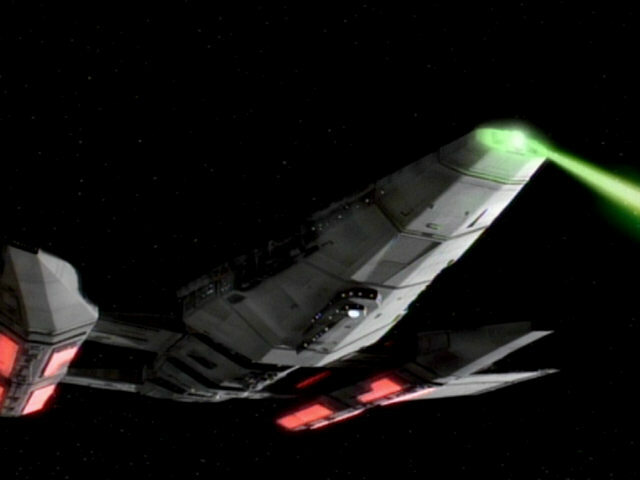 More new footage of the new shuttle model being fired upon by the Tamarian vessel. 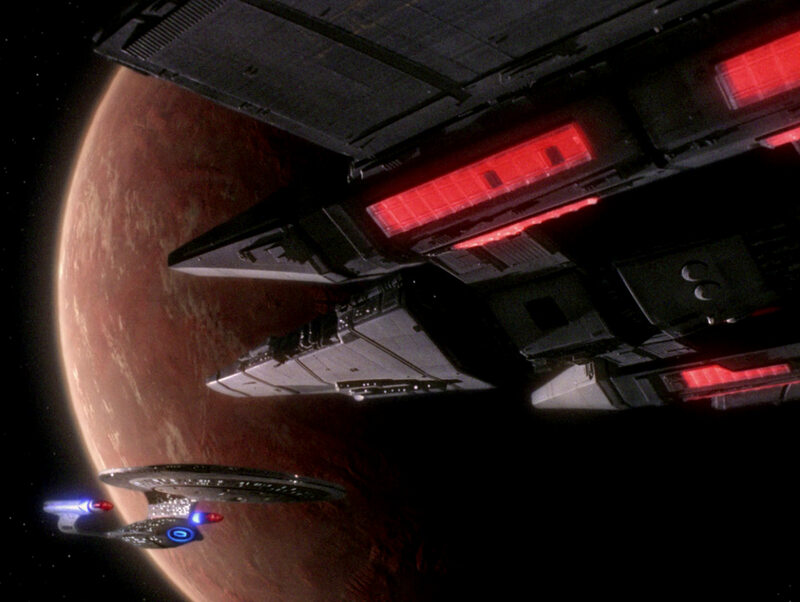 The scene in HD. 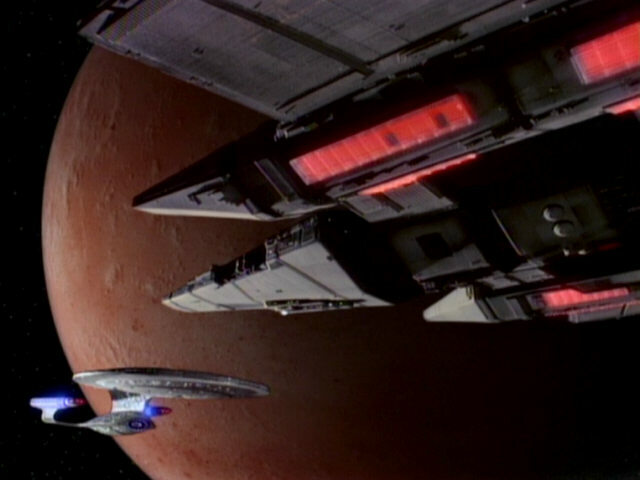 A scan of the atmosphere of El-Adrel IV. 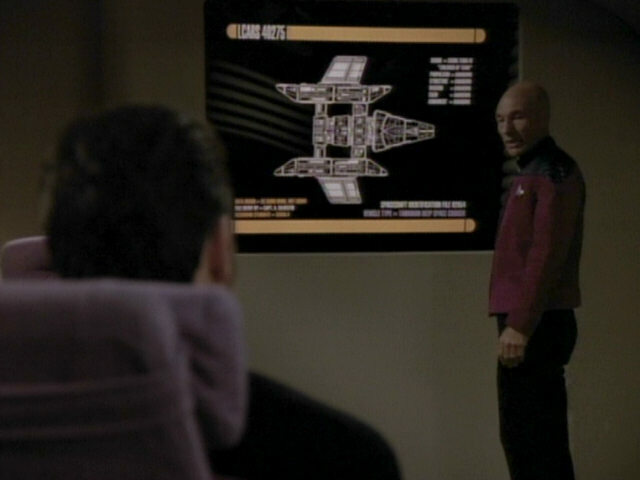 The graphic was faithfully reconstructed. 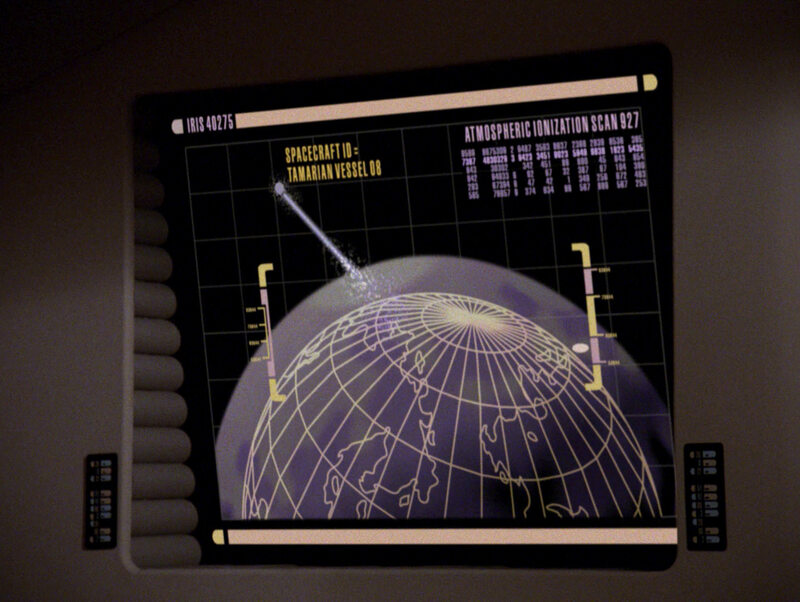 Aside from the better quality, only the different planetary grid gives away that it is not the original one any more. 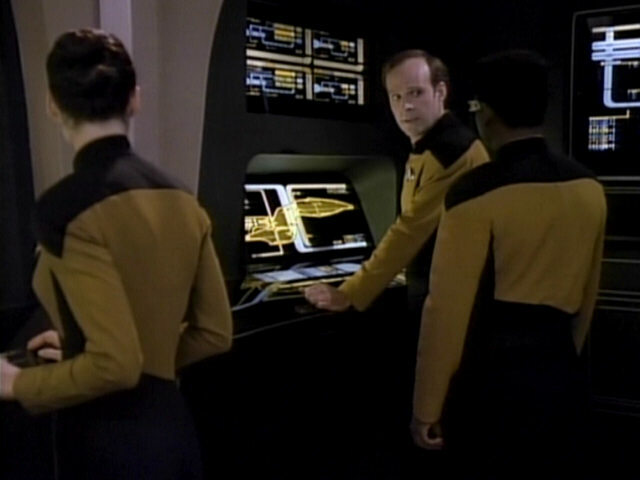 A video recording of the conversation between Captain Dathon and his first officer as displayed on the large monitor in Data's desk. 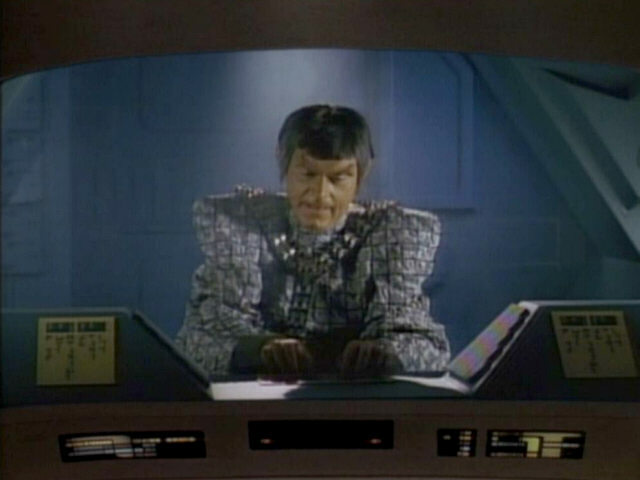 A screenshot from a similar angle shows what the monitor looked like in the second season episode "The Schizoid Man". 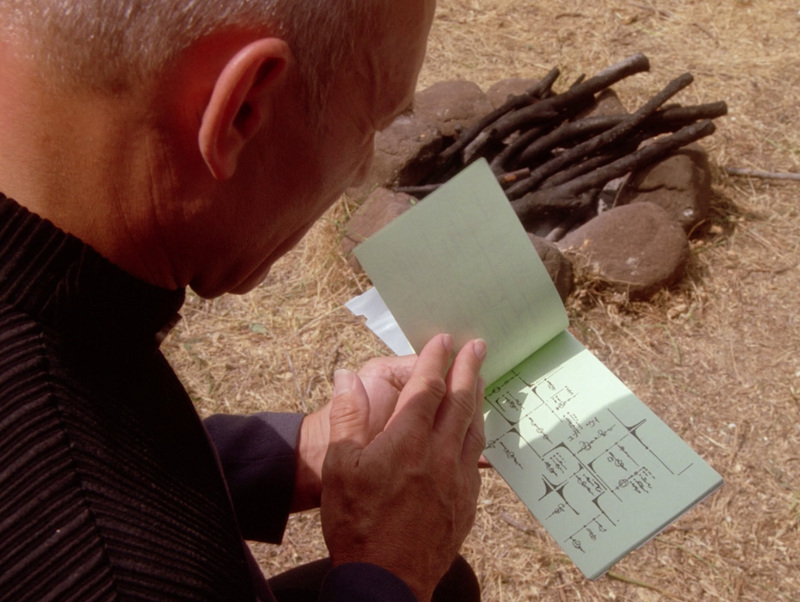 Man" The reconstructed screen in TNG-R.
After the filming of "Star Trek VI: The Undiscovered Country" had finished, the junior officers quarters, originally created for "Star Trek: The Motion Picture" was torn down and a new junior officers quarters set was built. 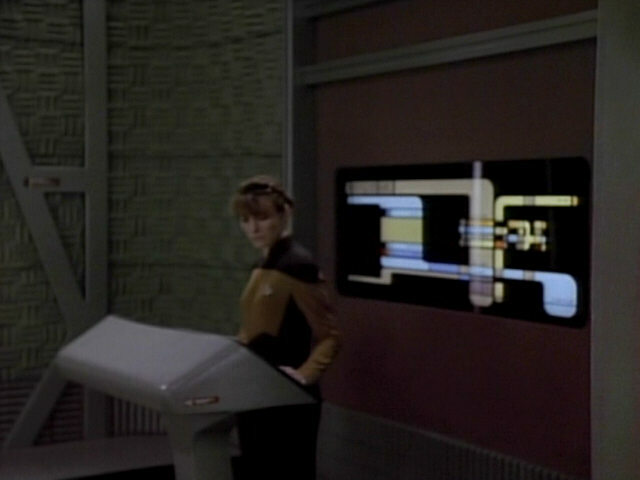 The new set debuts in this episode. 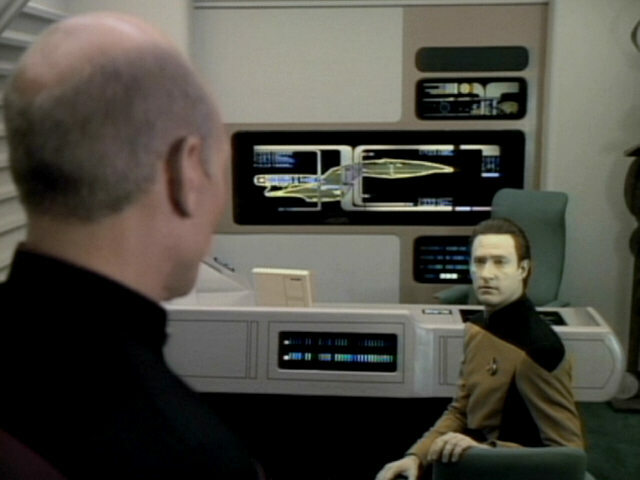 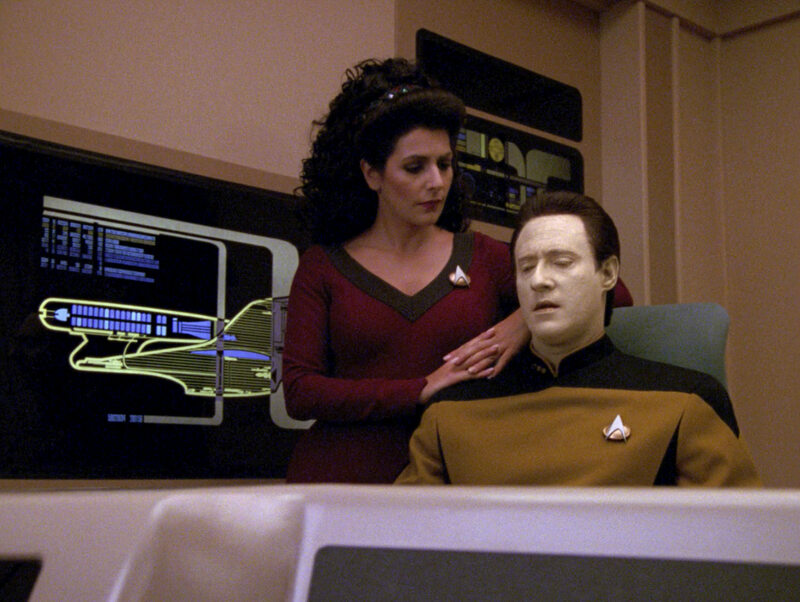 When it is redressed as Data's quarters, it still features the array of LCARS displays behind Data's desks and a metal sculpture, both also part of the original set. 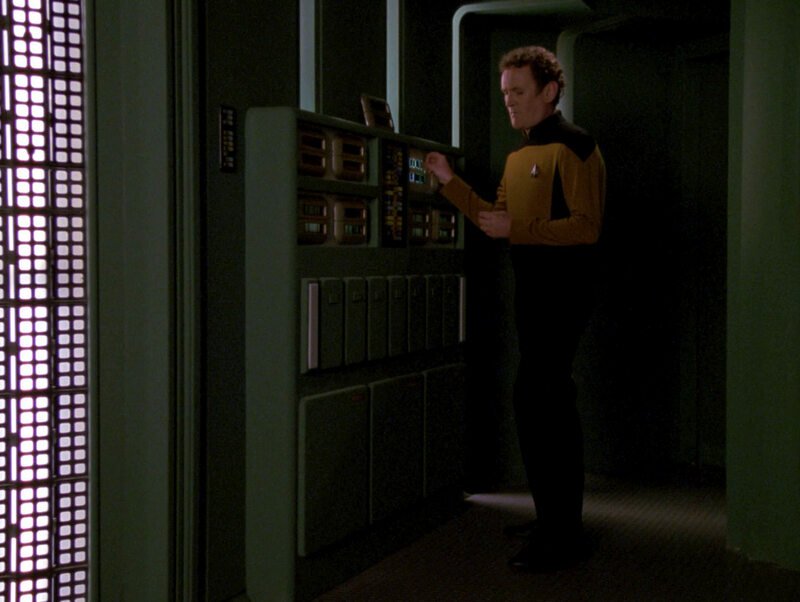 "Clues" Data's quarters in HD. 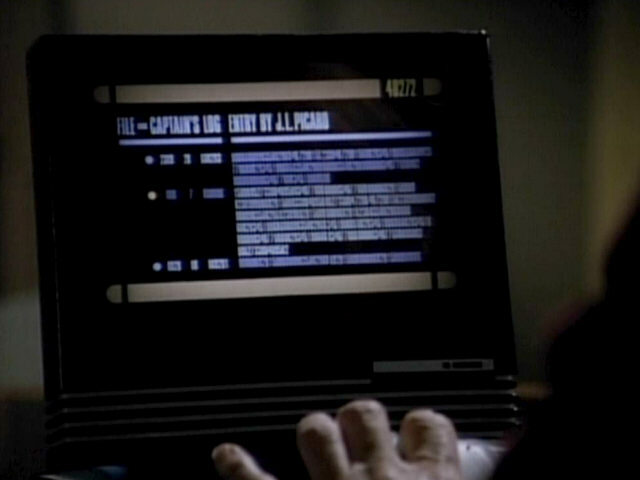 Data's desktop monitor displays a graphic also seen on Troi's monitor in "The Price" and Picard's monitor in "Yesterday's Enterprise". 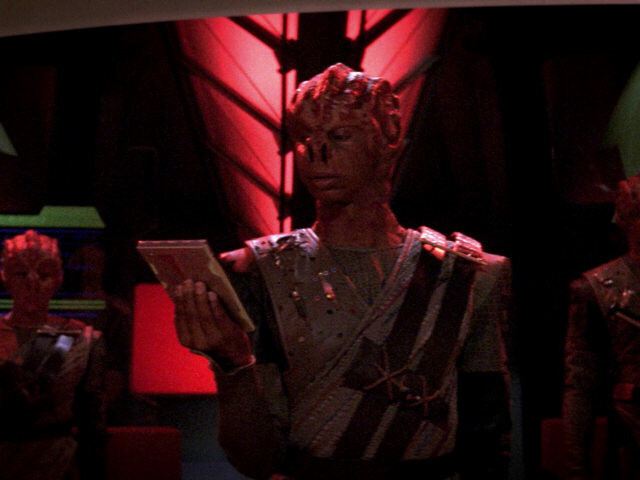 A close-look at Dathon's captain's log/diary. 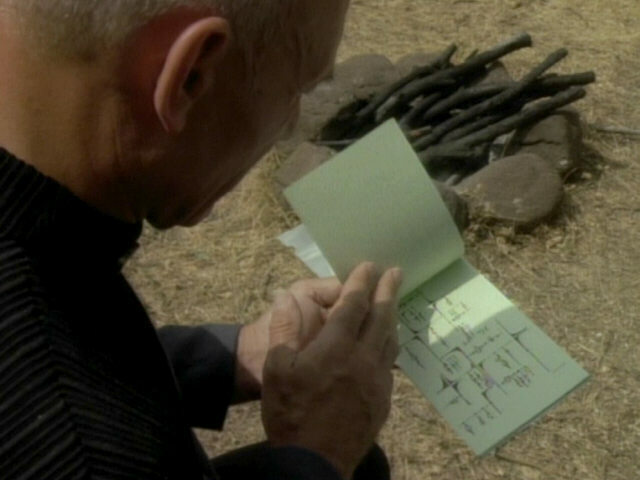 As can be seen, both pages feature the same arrangement of Tamarian writing. 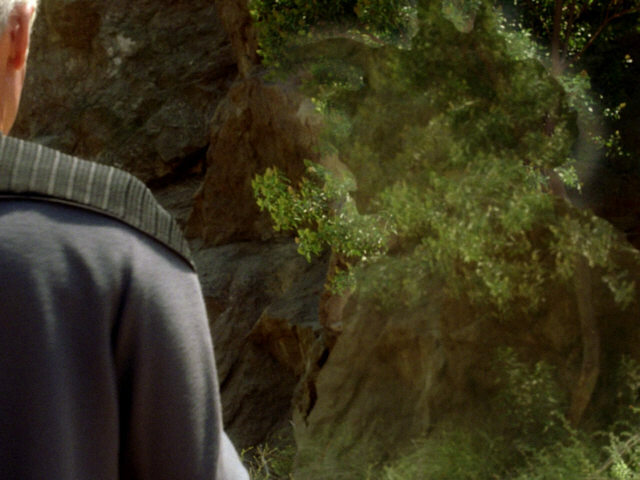 A better look at the writing in HD. 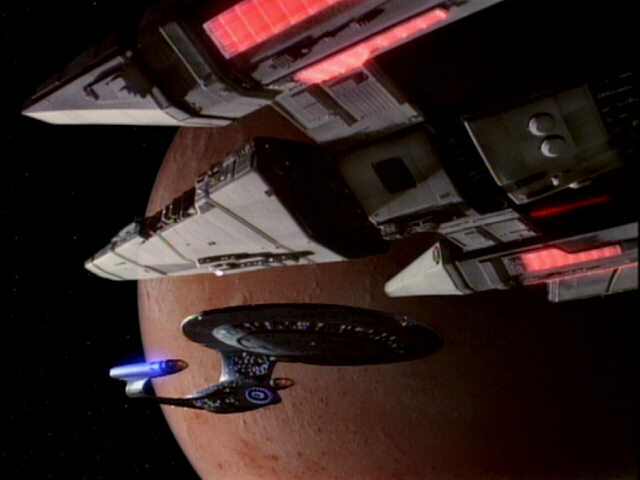 Some small modifications of the main engineering set can be seen in these screenshots. 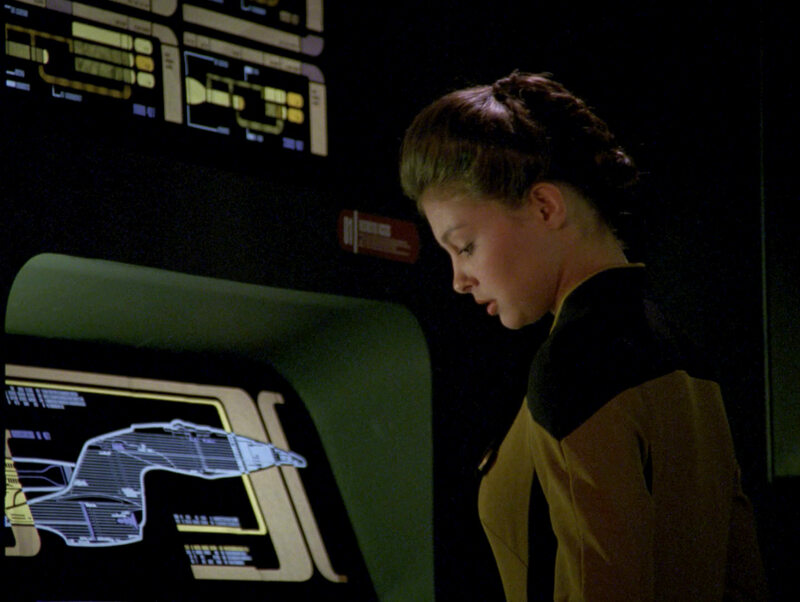 The graphic of the USS Enterprise-D displayed on the aft console and the LCARS displays in the three small side consoles were changed. 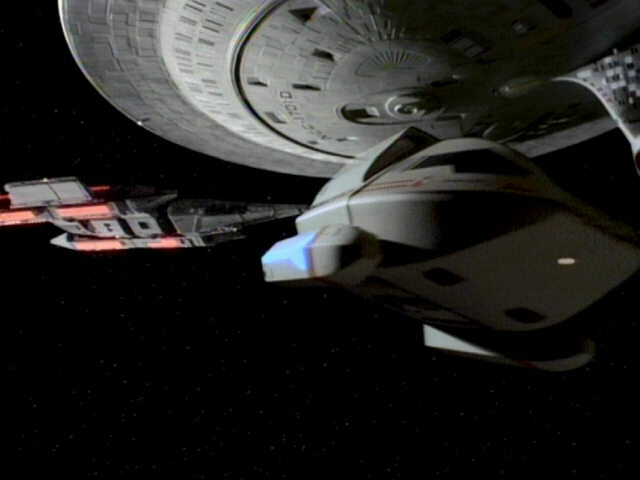 "The Nth Degree" A better look at the engineering set in HD. 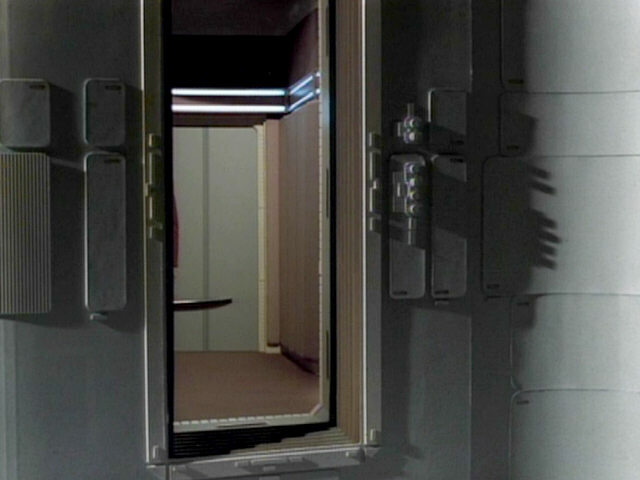 Except for the addition of a small LCARS panel, the side entry to the transporter room seems virtually unchanged since season 4, even though the set was used in "Star Trek VI: The Undiscovered Country". 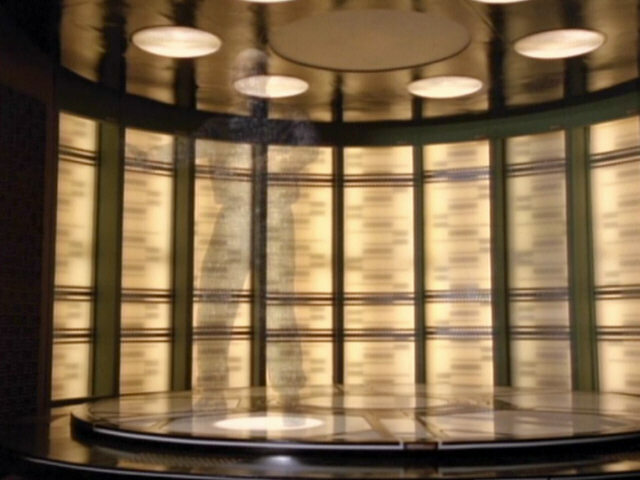 "Remember Me" The console in HD. 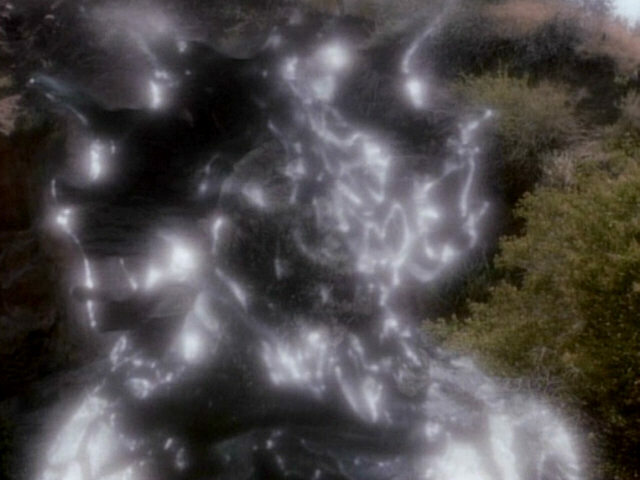 A first blurry look at the native life-form of El-Adrel IV. 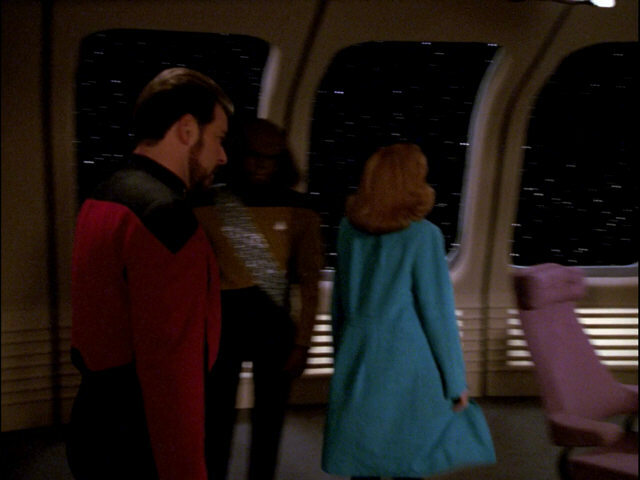 The reconstructed effect in the remastered episode. 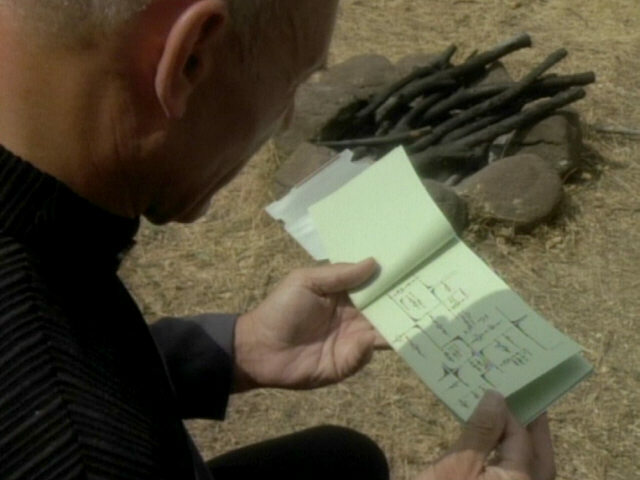 Another modification to the engineering set can be seen in this screenshot. 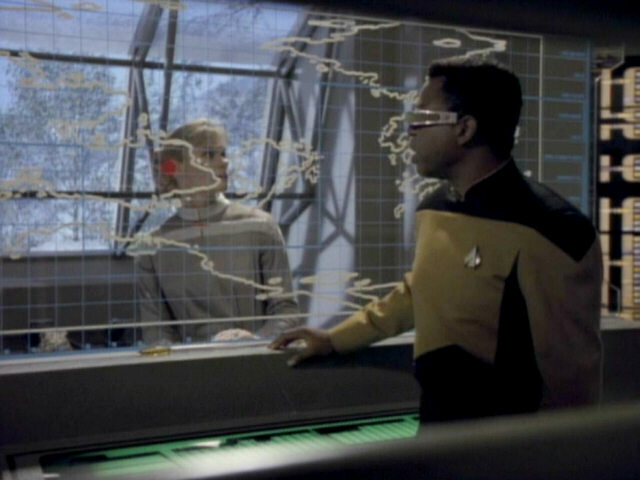 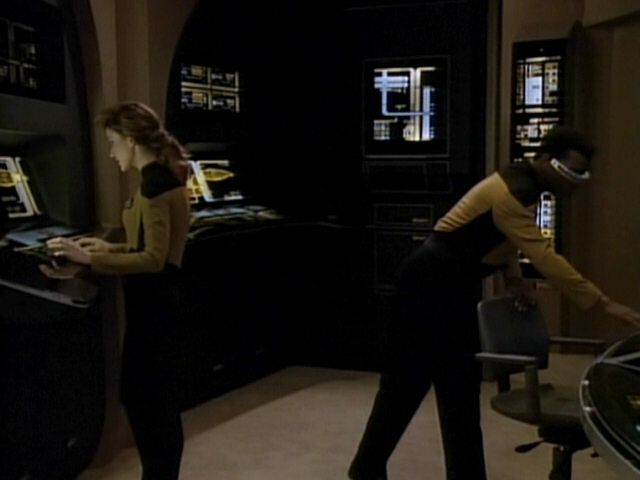 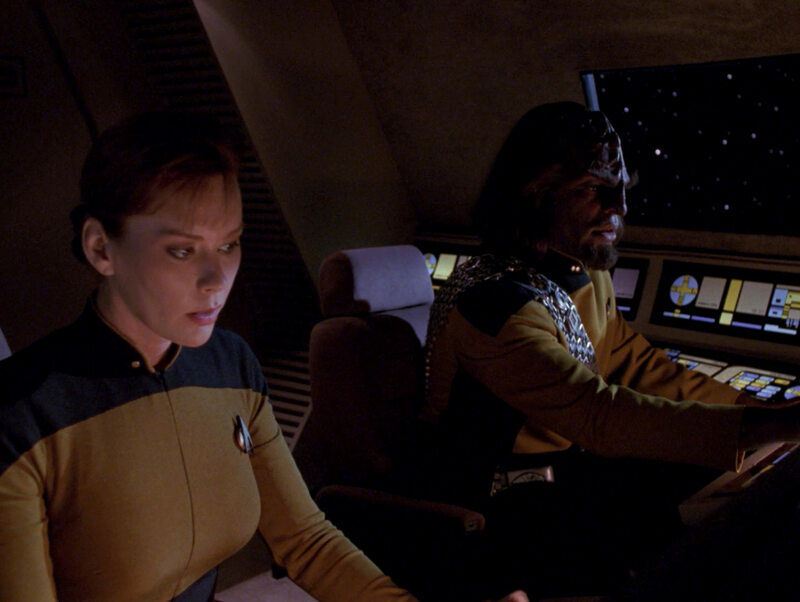 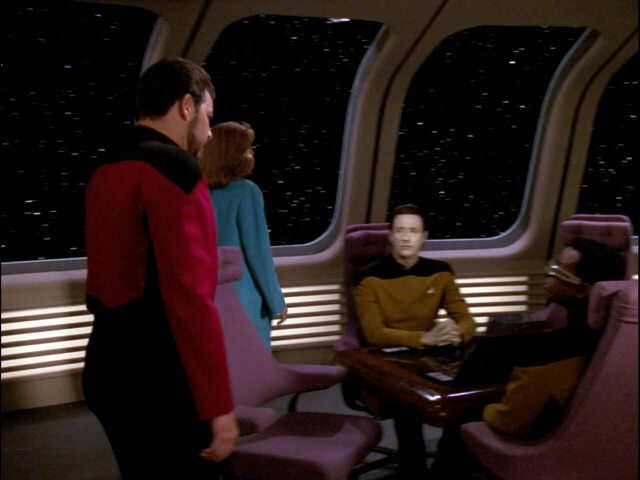 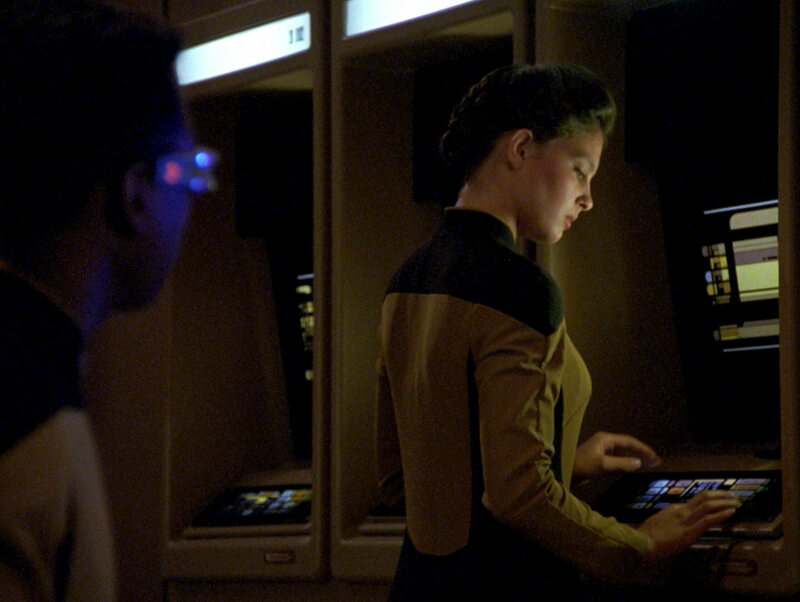 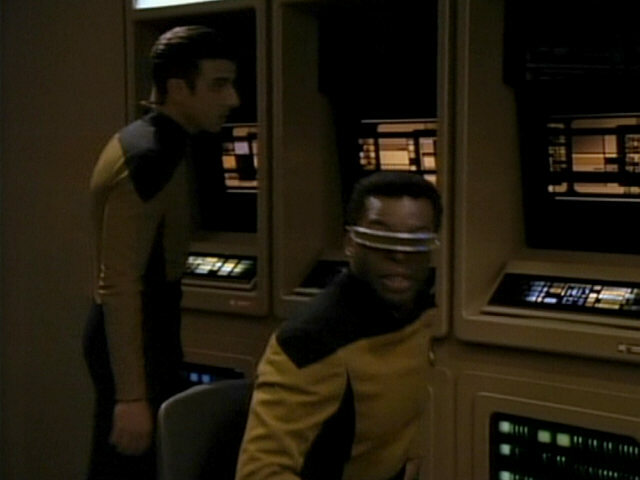 The back console seen behind Geordi was turned 90°, as can be seen when comparing its configuration here to the one in the season 4 episode "Galaxy's Child". 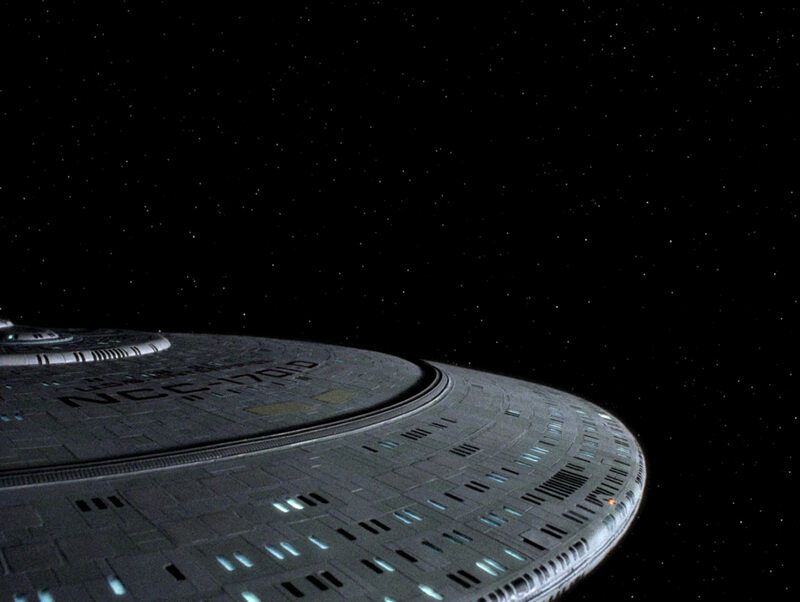 "Galaxy's Child" The set in HD. 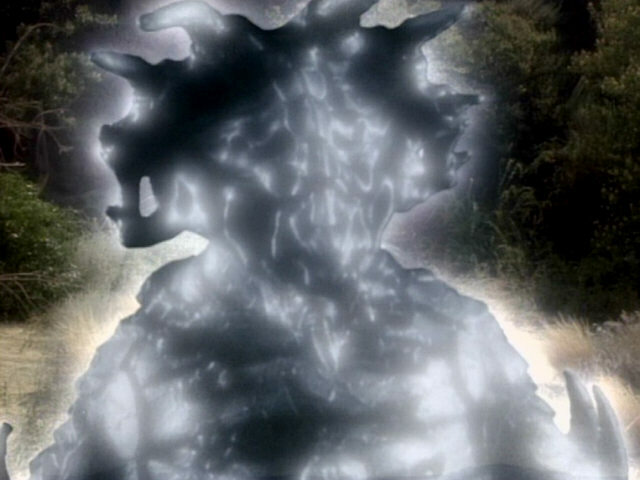 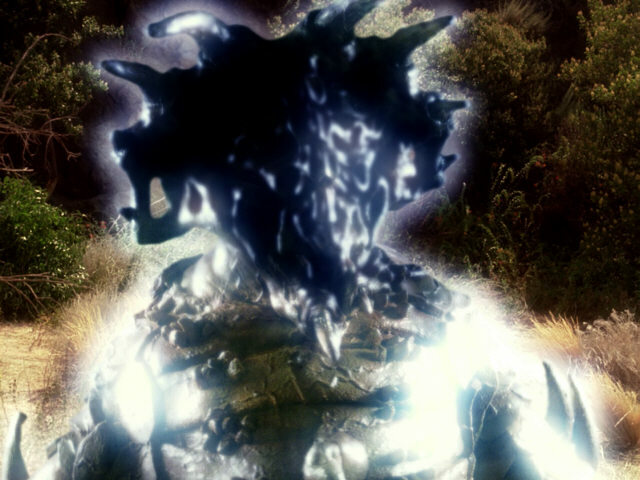 A better look at the partly cloaked native life-form of El-Adrel IV. 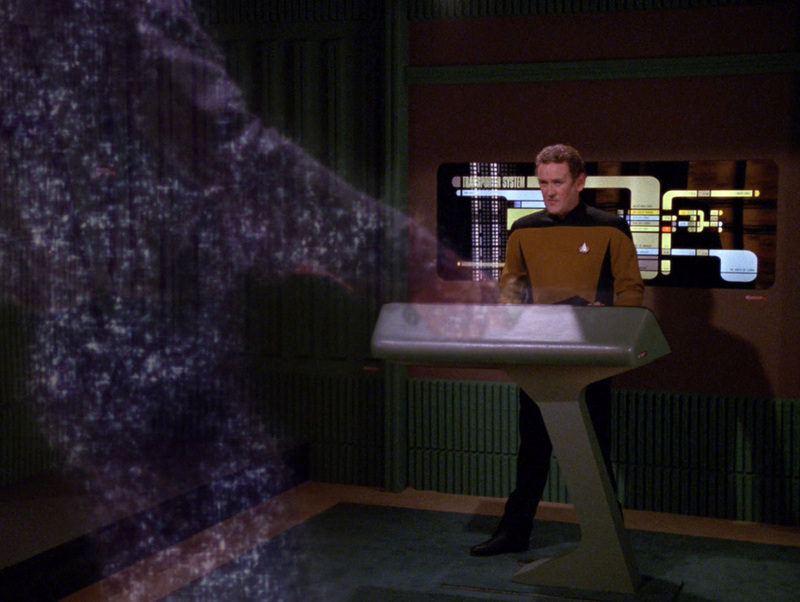 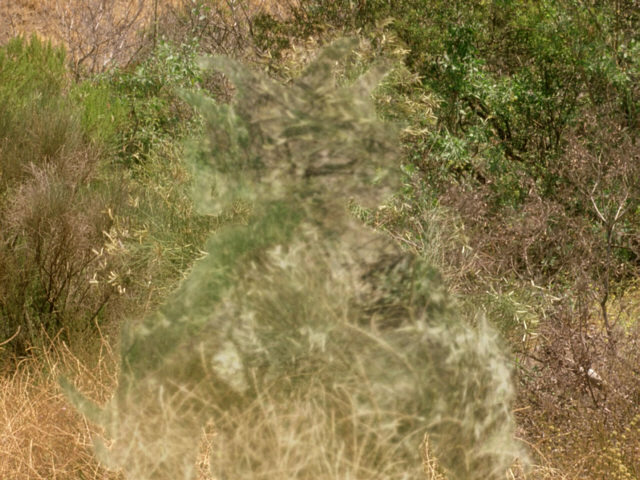 In this shot, the cloaking effect appears slightly more purple than in later shots. 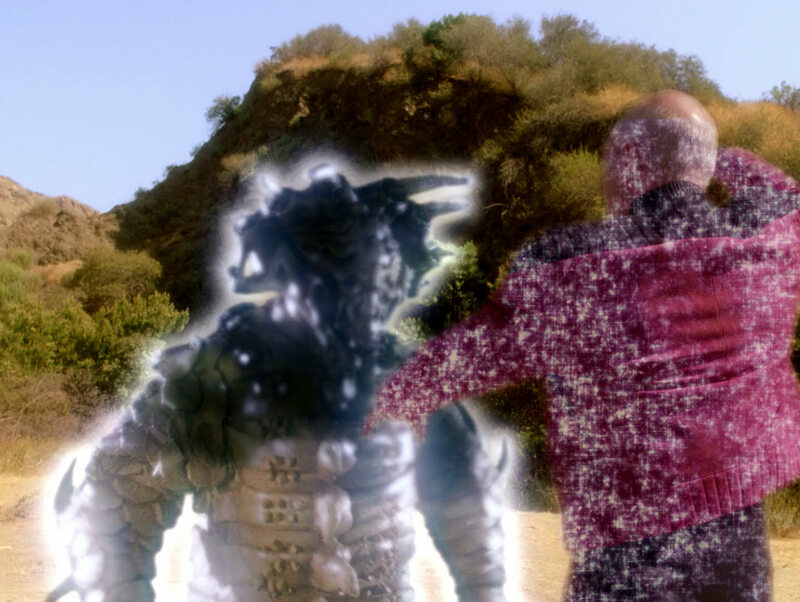 The effect in the remastered episode. Strangely, the blue ceiling light of the central transporter platform is not turned on in this scene. 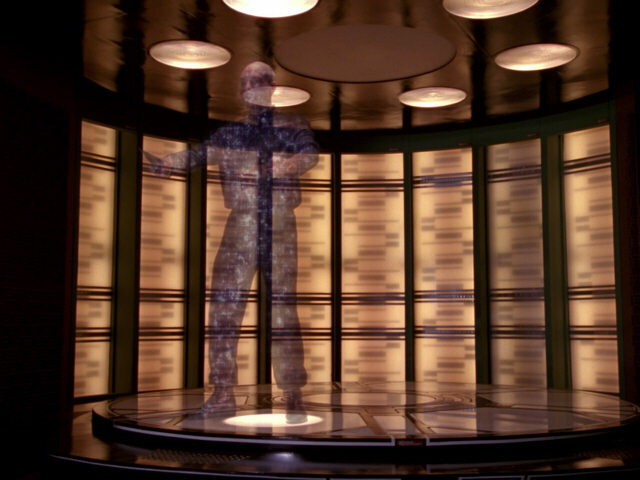 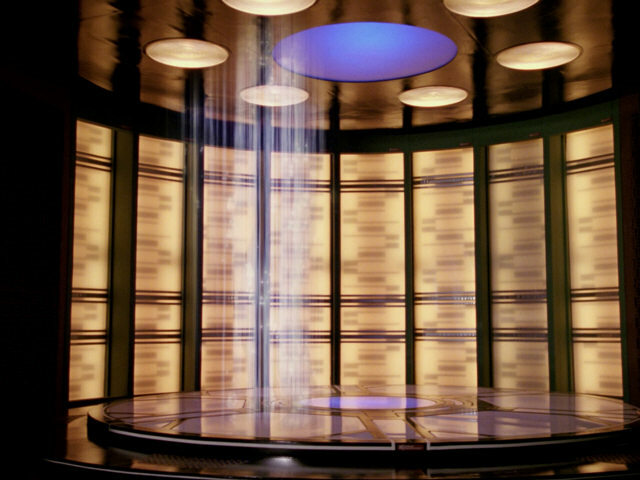 In other appearances of the transporter room (and later in this episode), the light is turned on. 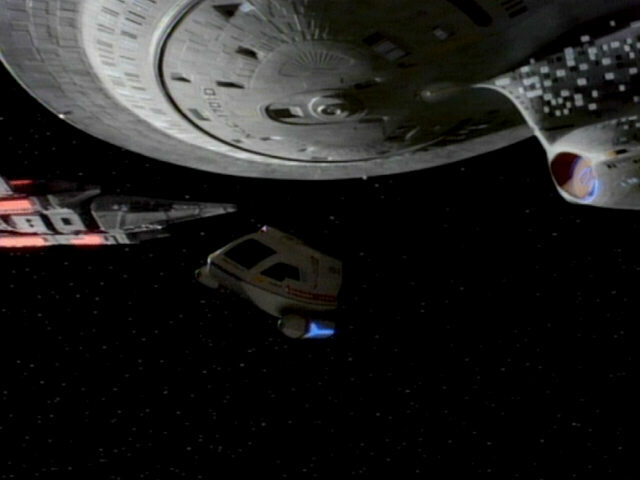 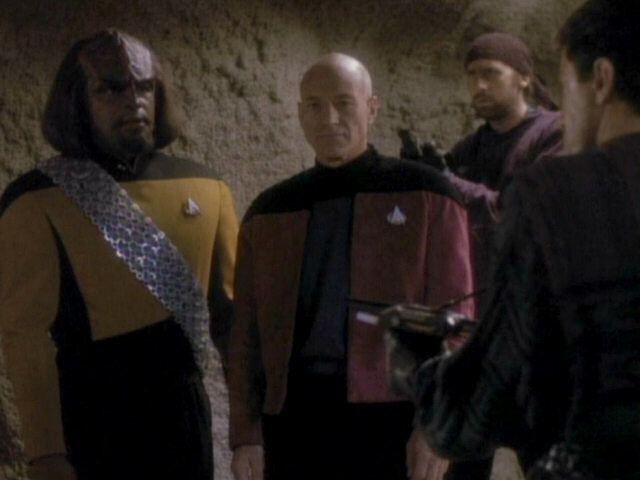 "The Wounded" The small omission was not fixed for TNG-R. 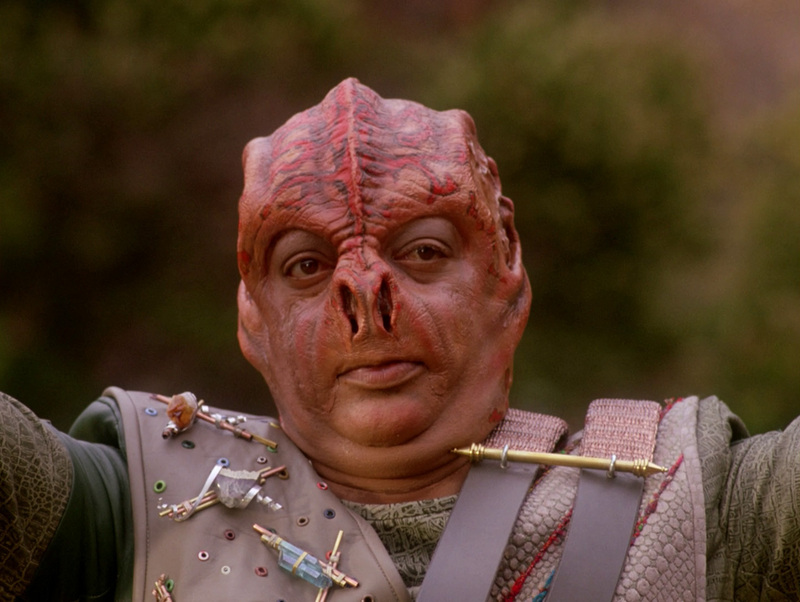 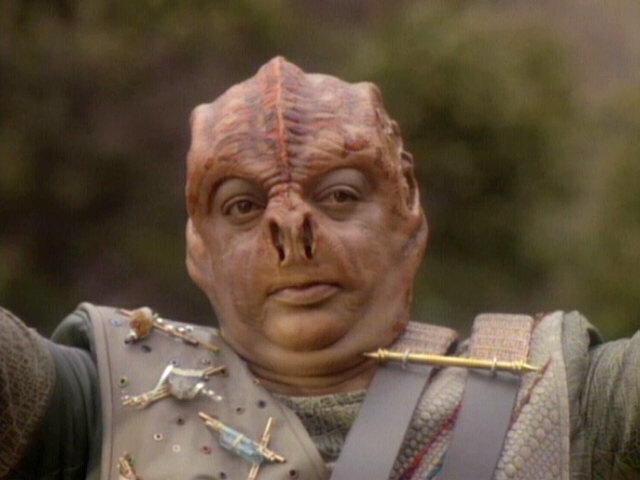 The alien lifeform beats down Captain Darmok. 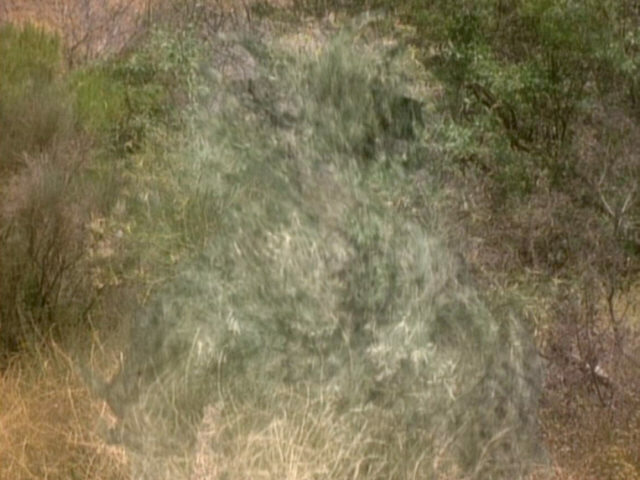 The effect in the remastered episode. 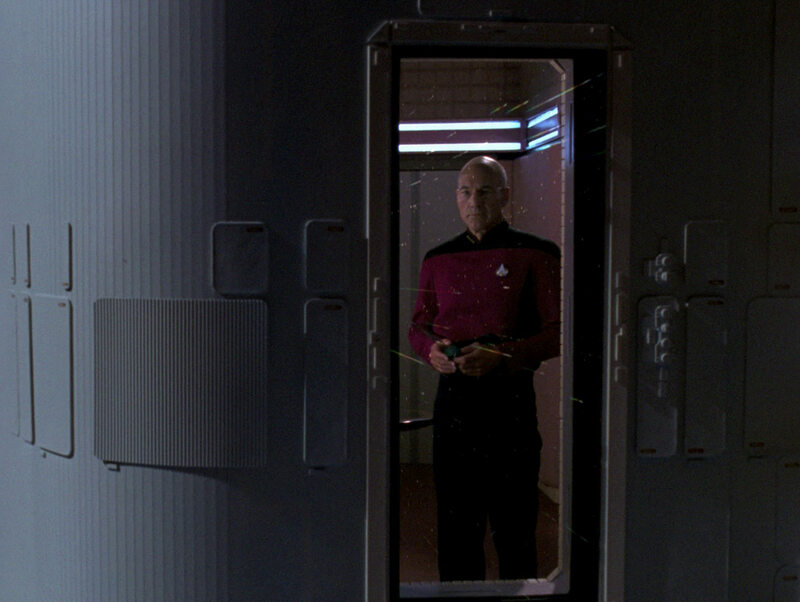 The transporter room walls were modified for "Star Trek VI: The Undiscovered Country". 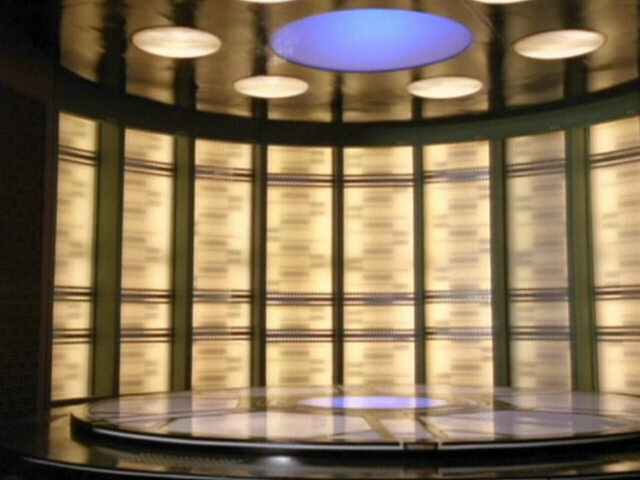 When the set was redressed as the USS Enterprise-D transporter room, the walls were modified again. 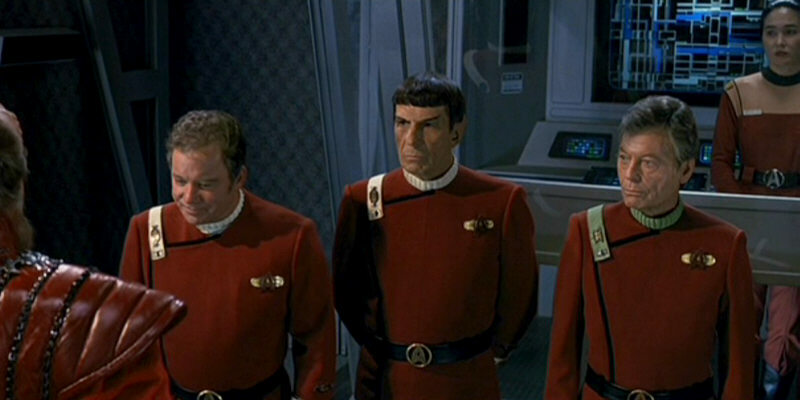 "Star Trek VI" A look at the wall in HD. 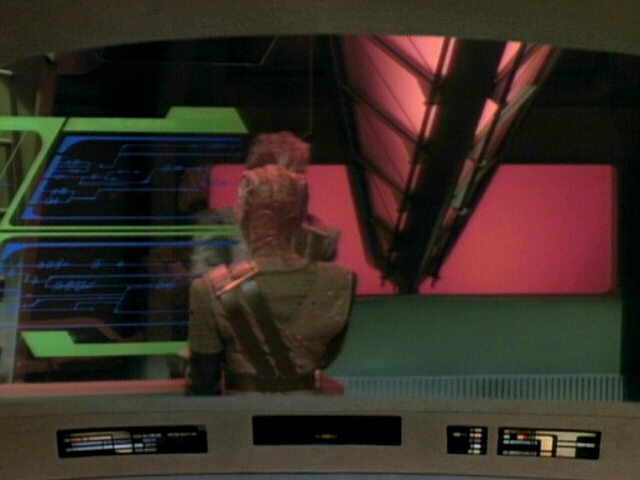 The Tamarian writing on the glass interface can be seen up close in this shot. 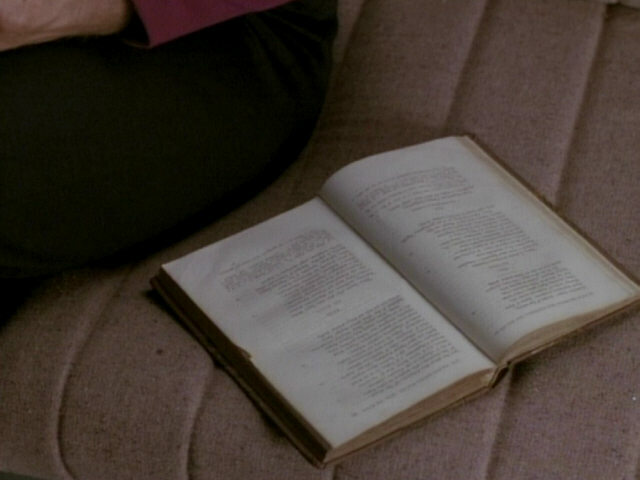 It is identical to the writing in Dathon's log. 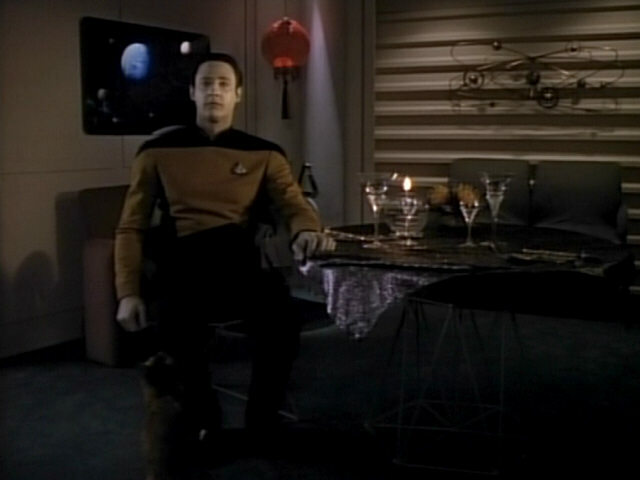 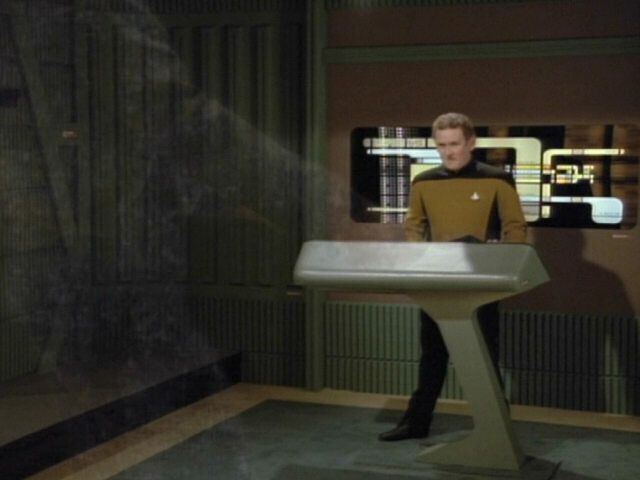 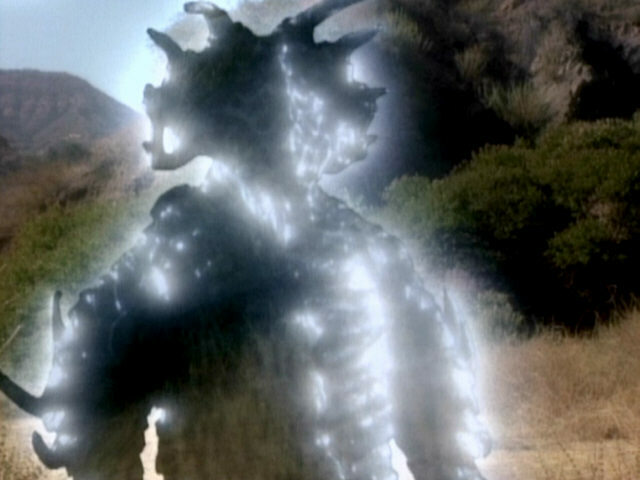 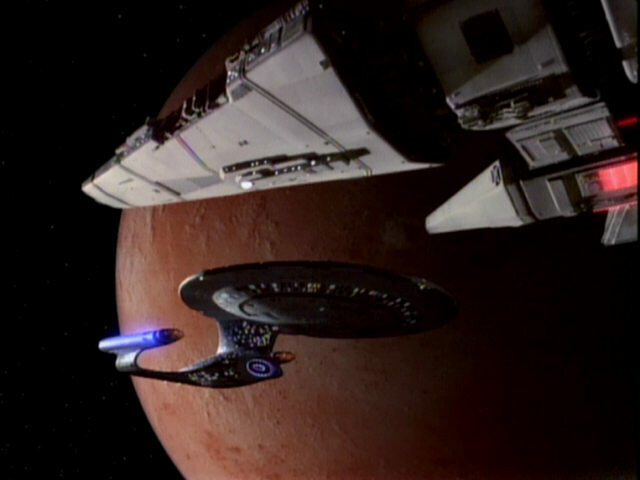 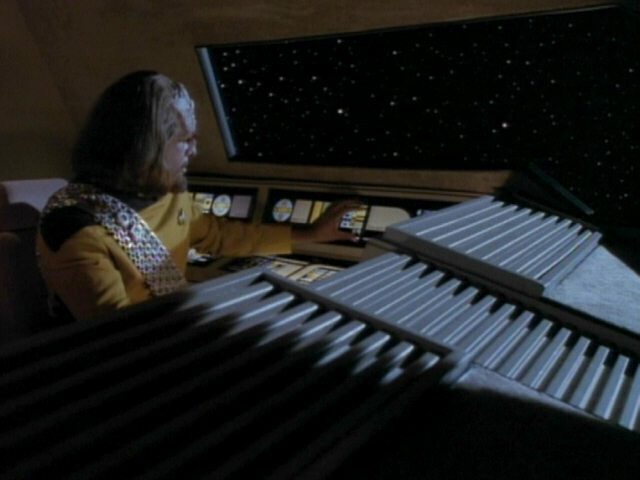 The set as it appears in TNG-R.
As mentioned earlier, the cloaking effect of the El-Adrel IV lifeform appears more blue than purple in the rest of the episode. 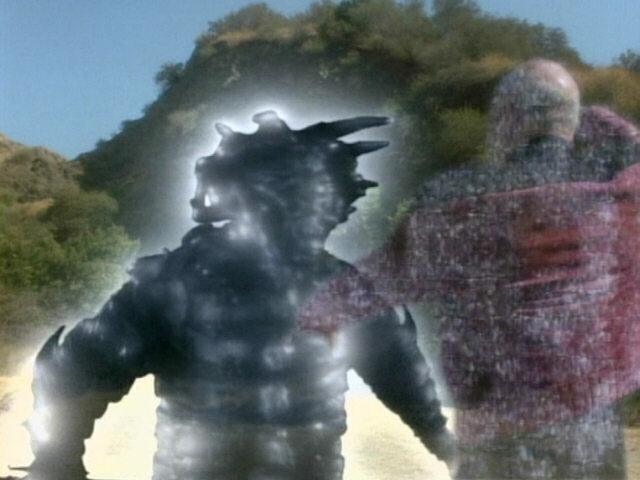 The effect in the remastered episode. 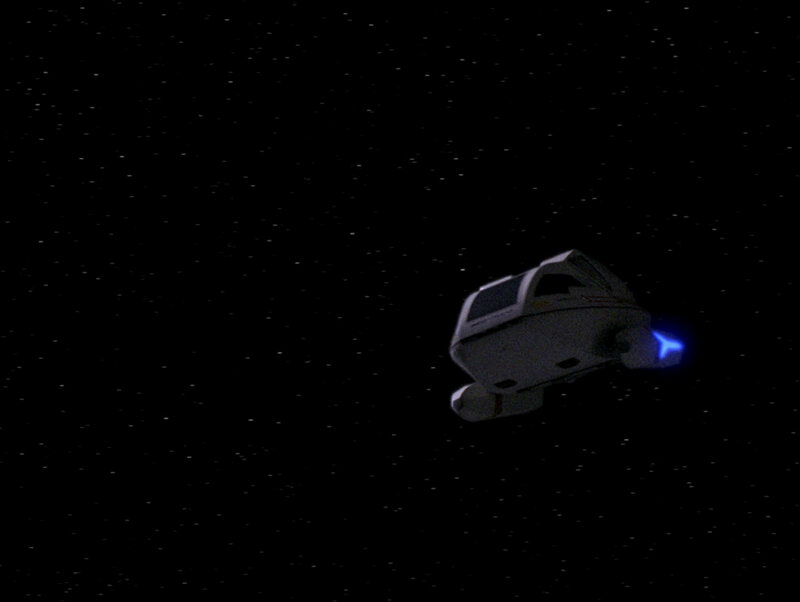 The camera moves from the Tamarian vessel to the USS Enterprise-D, both in orbit of El-Adrel IV. 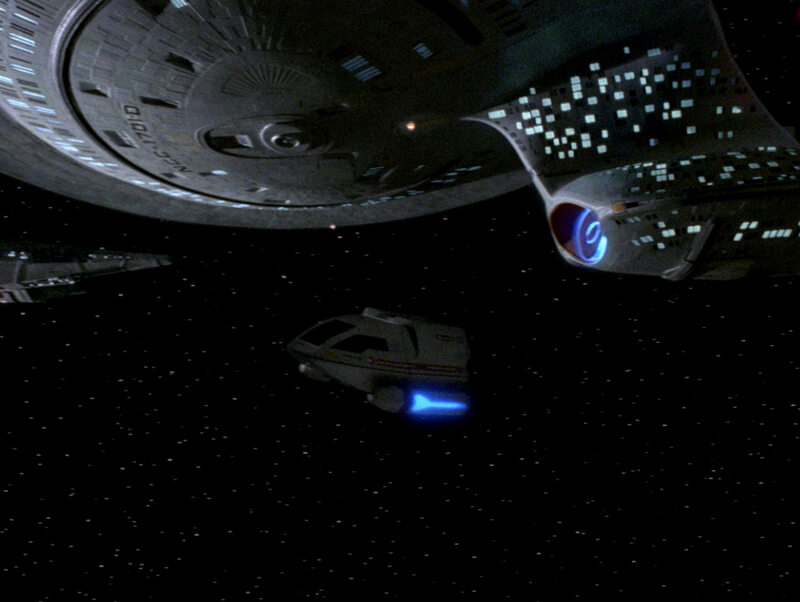 The ships in HD. 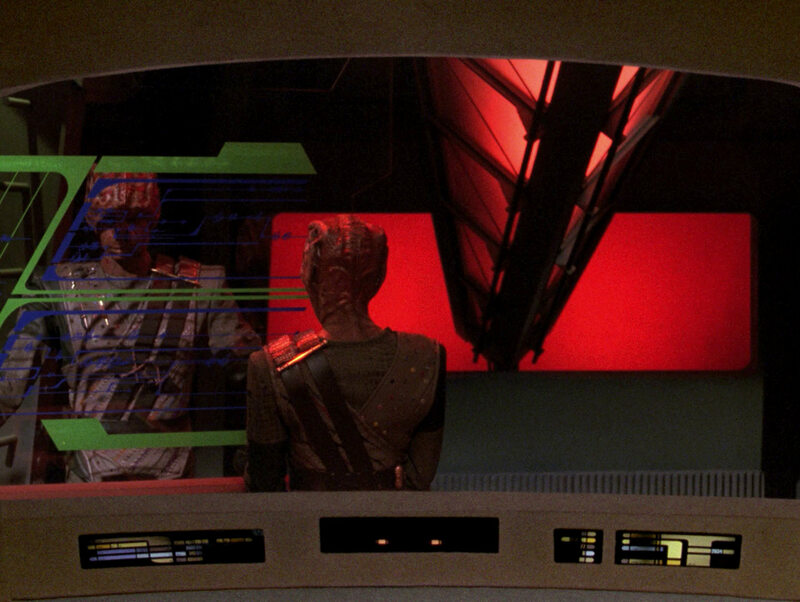 Filming equipment can be briefly seen twice at the top of the screen in this scene set in the observation lounge. 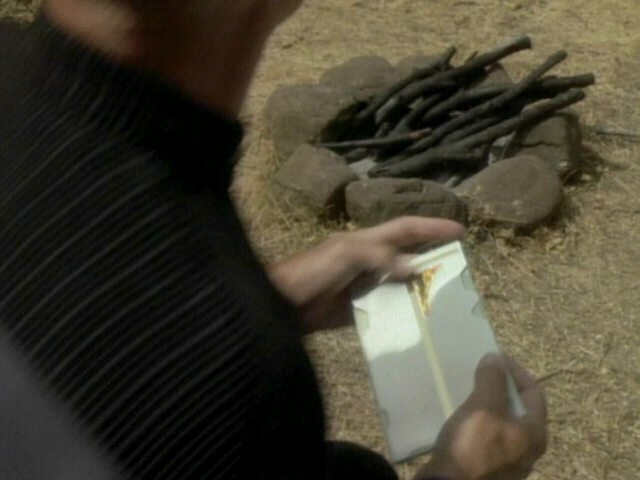 The filming equipment is still visible in the remastered episode. 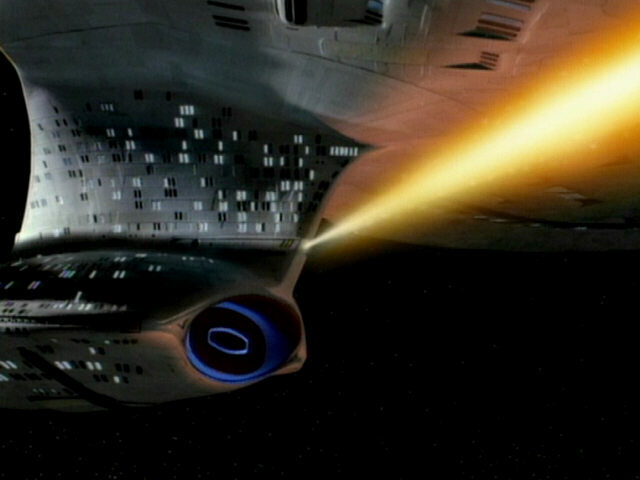 The USS Enterprise-D fires at the Tamarian vessel. 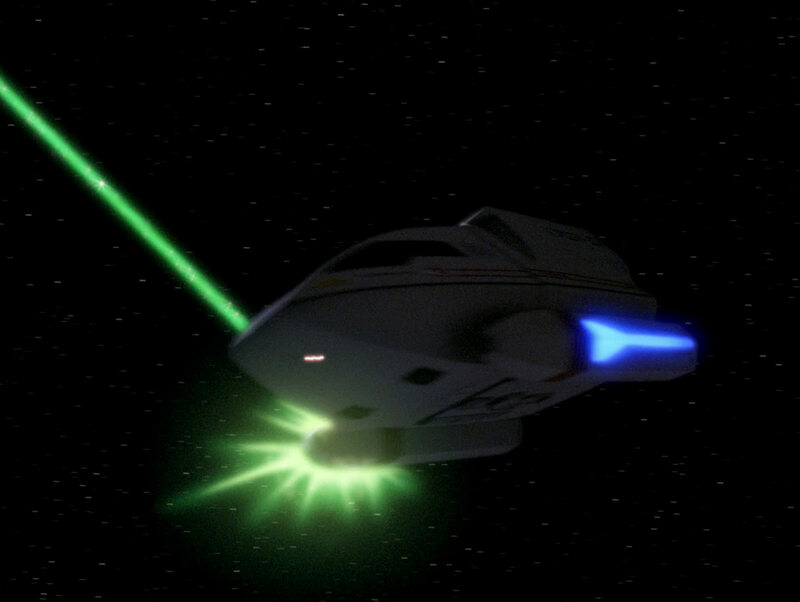 The phaser beam incorrectly emanates from the torpedo launcher. 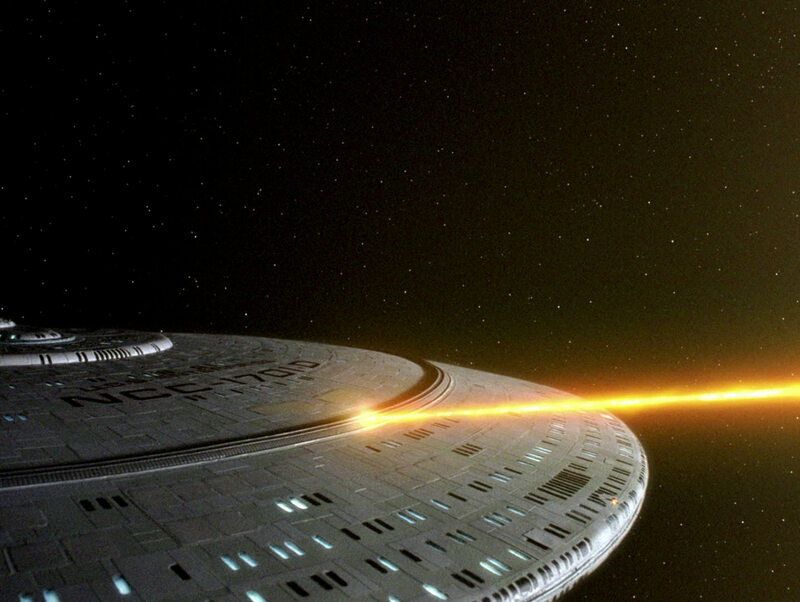 Both Worlds I" As the original shot didn't allow proper placement of a phaser beam being emitted from a phaser strip, this shot was replaced with a shot showing a phaser beam being fired from a dorsal saucer phaser strip, filmed for "The Best of Both Worlds I". 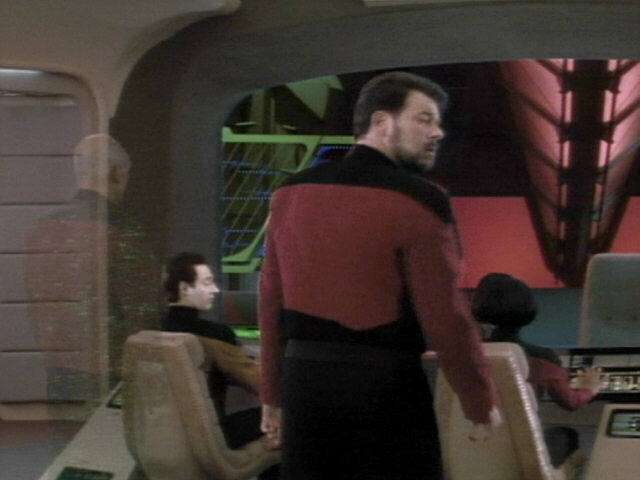 This is the arguably biggest visual change in TNG-R so far. 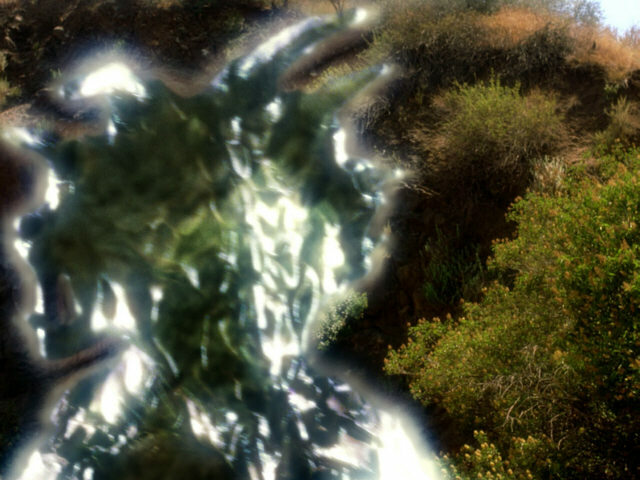 Two final shots of the El-Adrel IV creature. 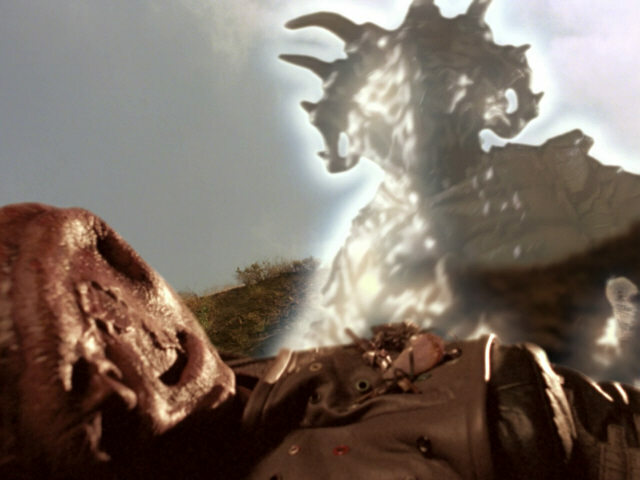 Only in HD, a telephone mast is visible in the background behind the monster. 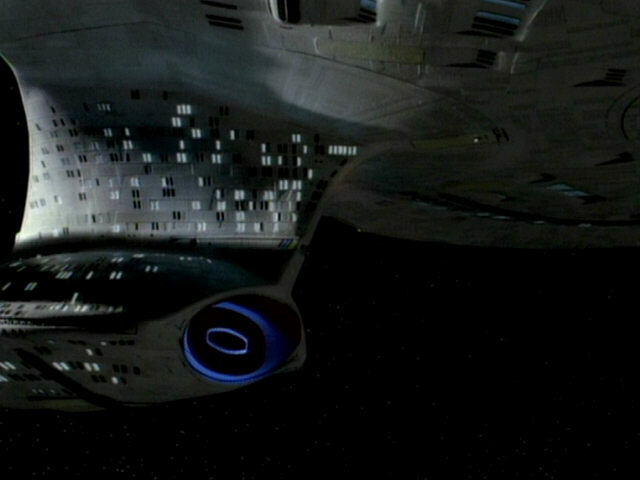 The central blue ceiling light is now correctly turned on. 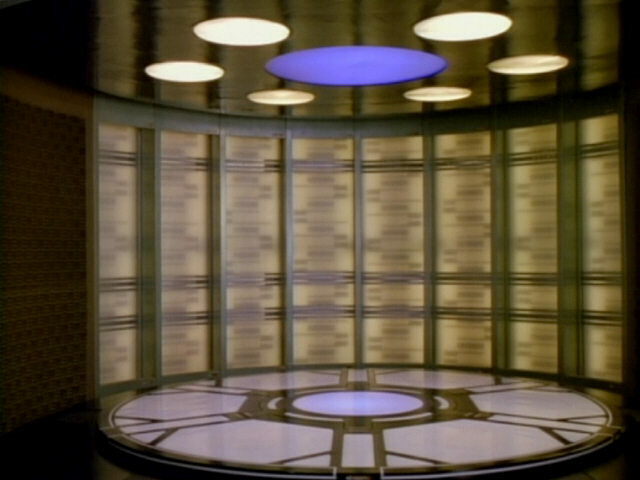 The transporter platform in HD. 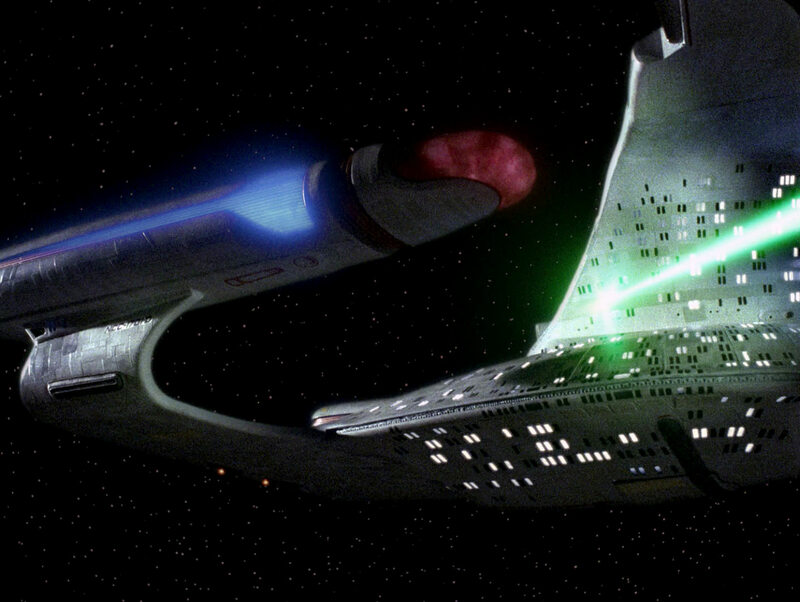 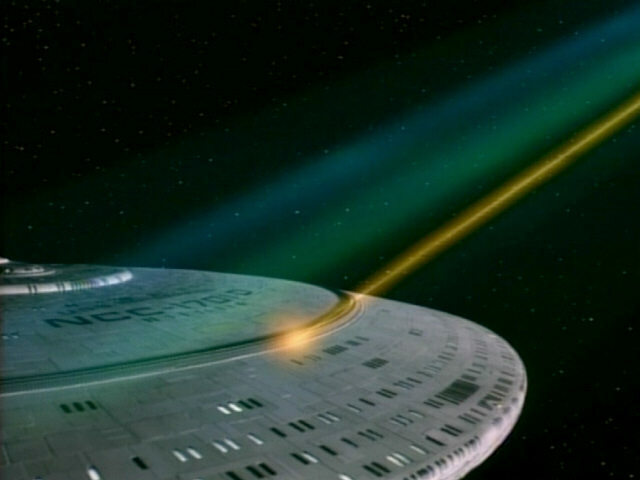 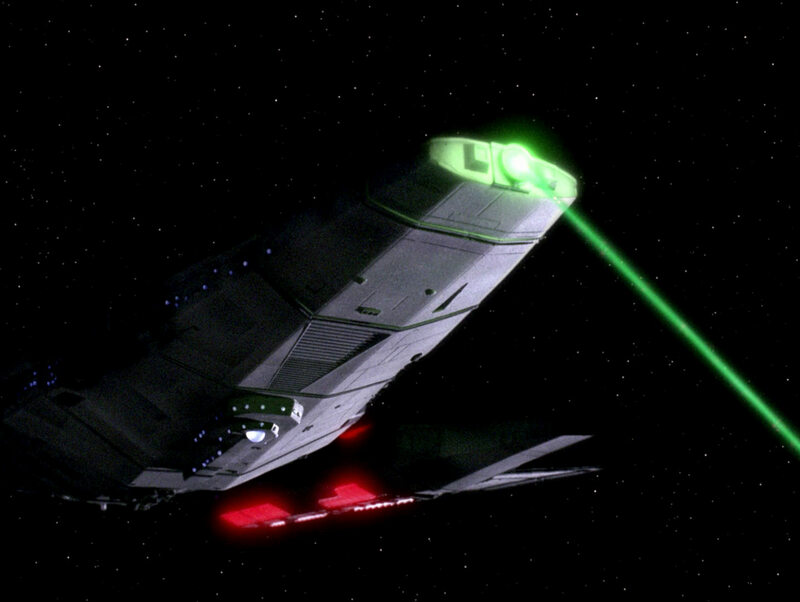 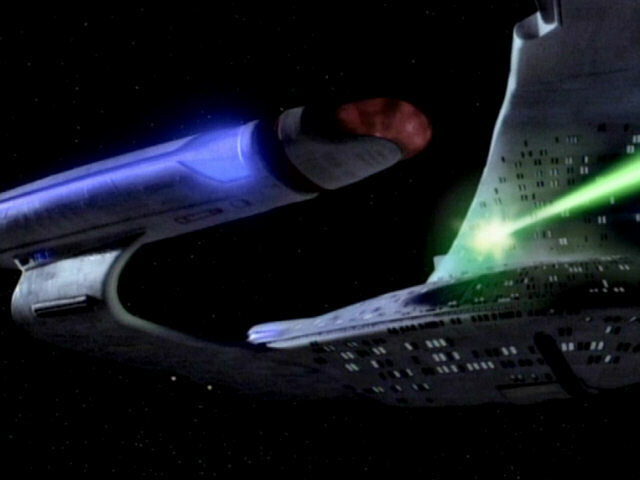 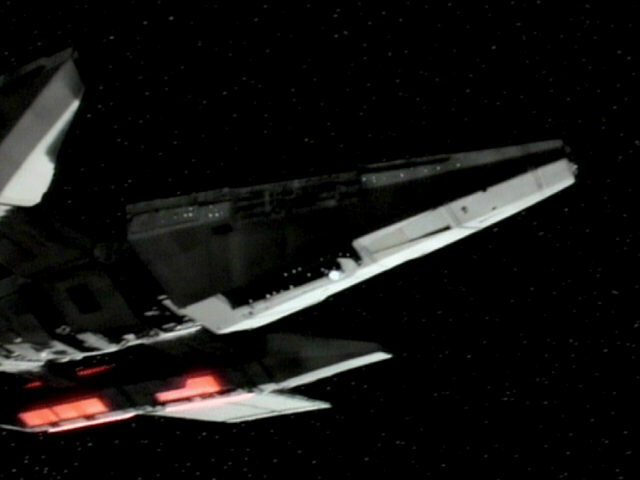 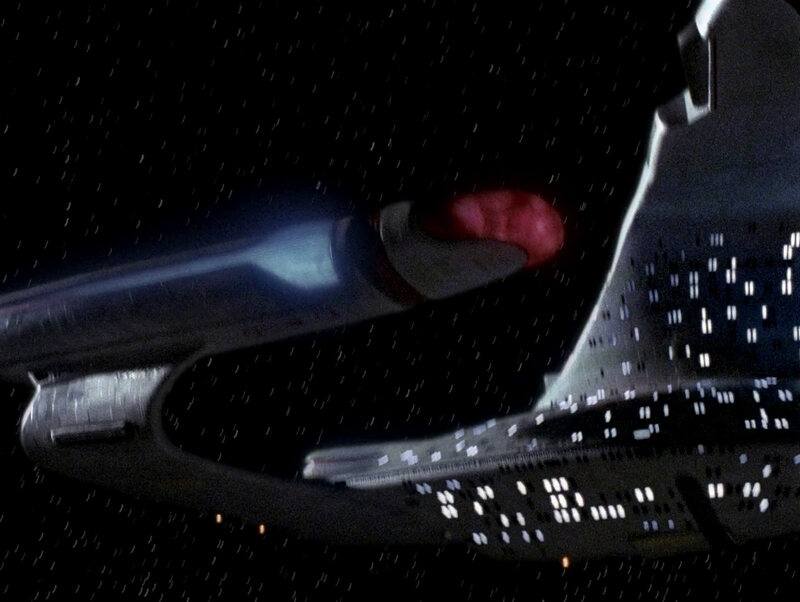 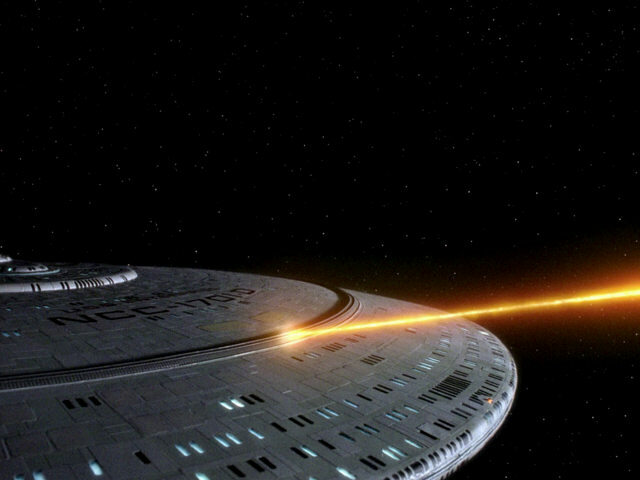 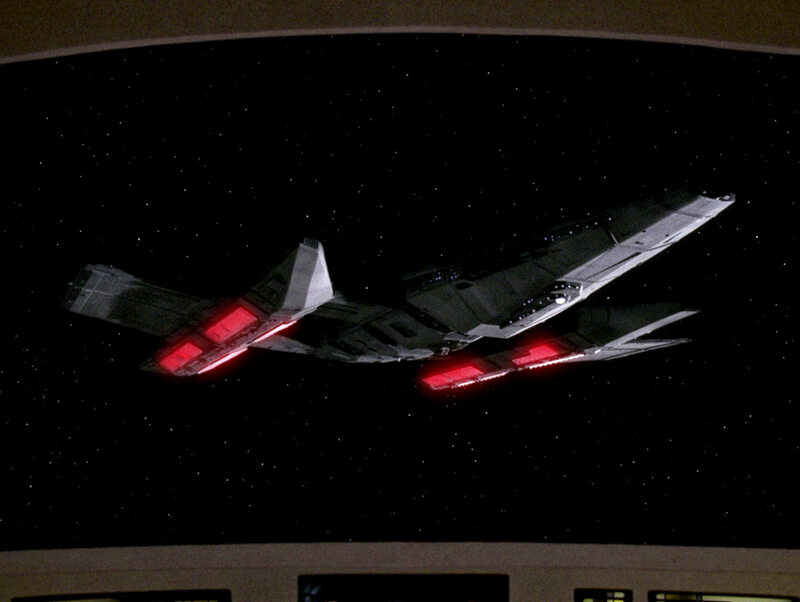 The Tamarian vessel fires at the starboard nacelle of the USS Enterprise-D whose blue lateral lights are briefly turned off by the weapons fire. 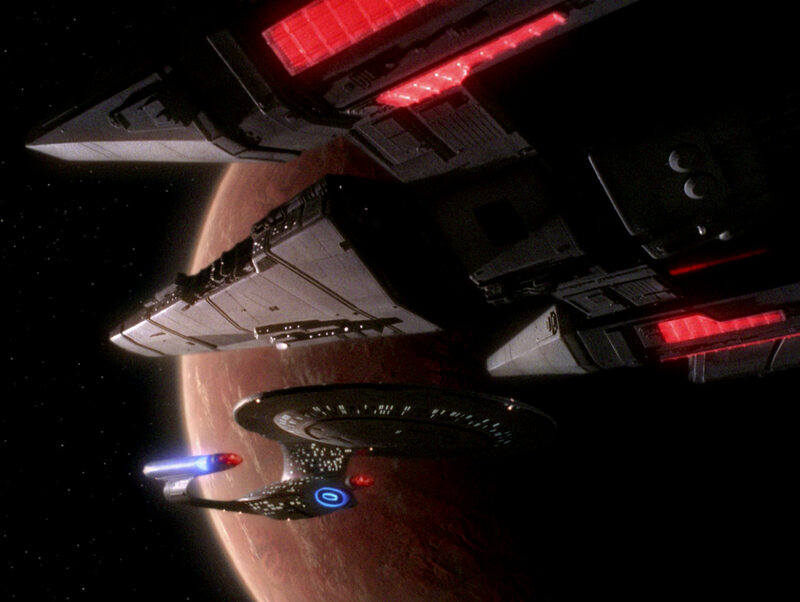 The great sequence in HD. 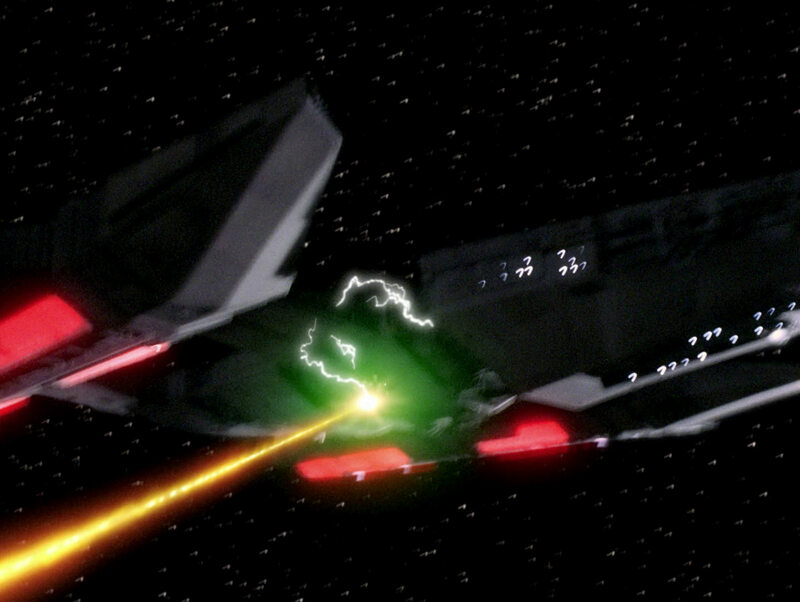 Another shot of the USS Enterprise-D incorrectly firing its phasers through a photon torpedo port. 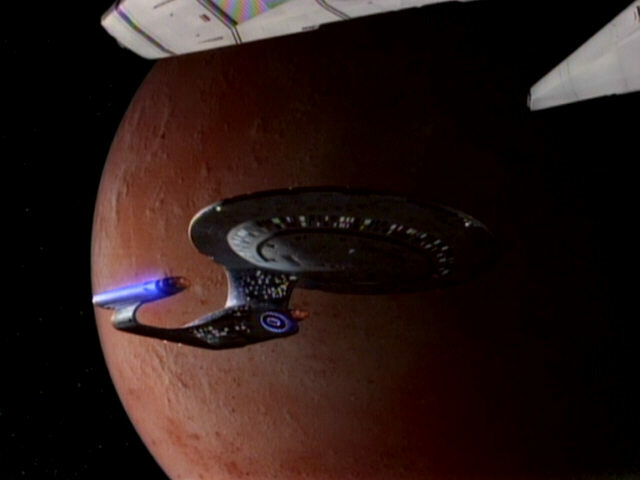 This shot was replaced by the same footage from "The Best of Both Worlds I" for the remastering of the episode. 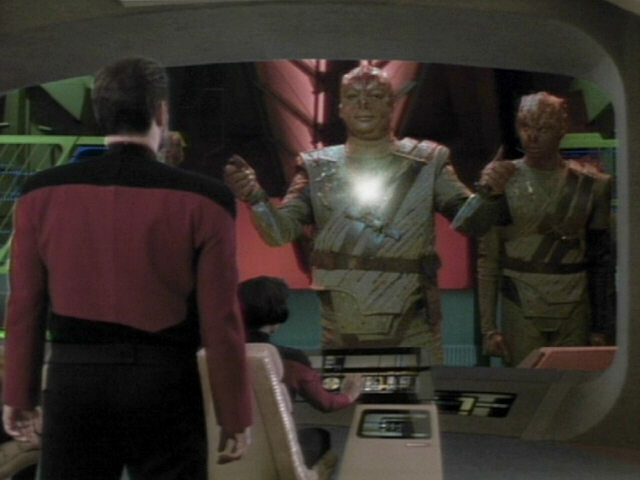 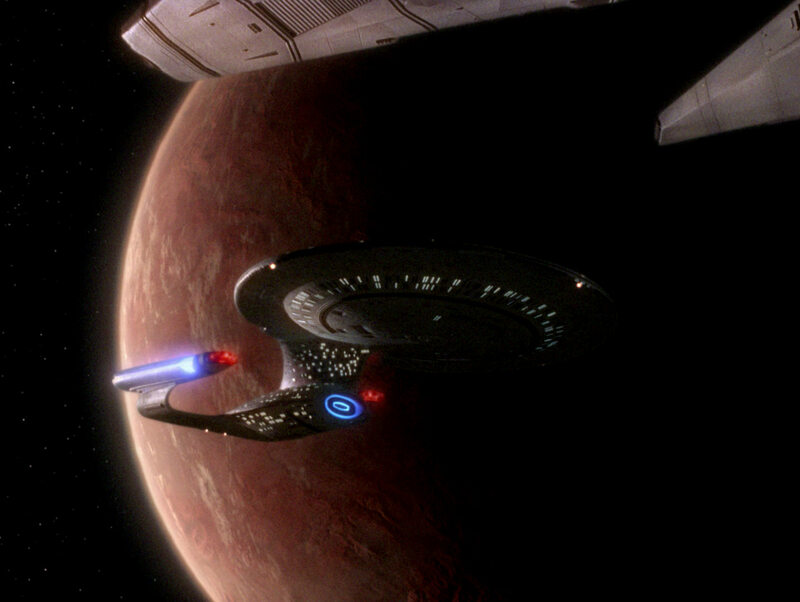 The shot of Dathon's Captain's log being beamed over to the Tamarian vessel was again realized using anamorphically filmed material and "pan & scan". The shot in HD. 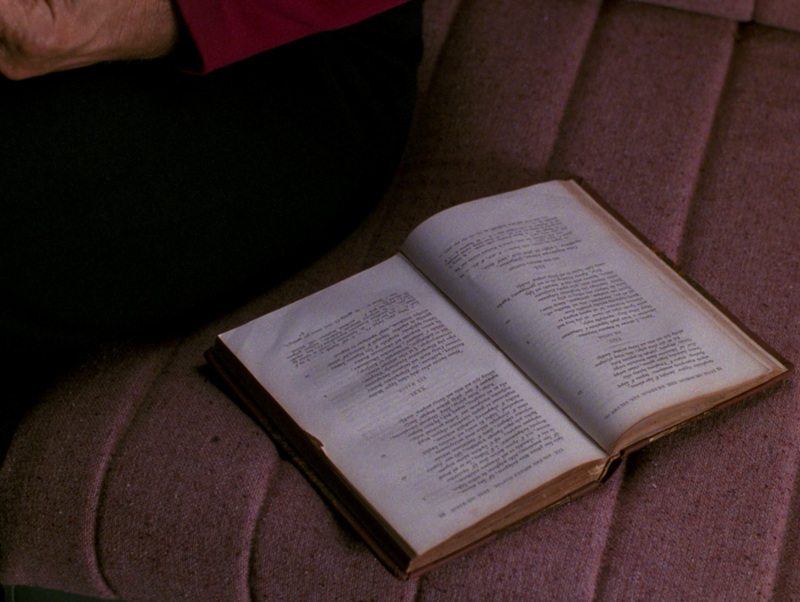 A close-up of Picard's volume of the epic of the Homeric Hymns. 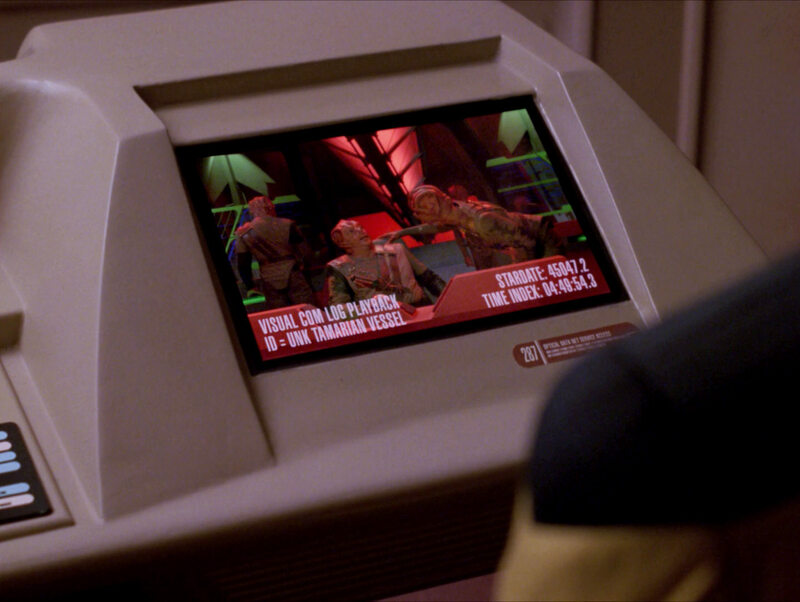 In HD, it can be made out that the text is written in Greek. 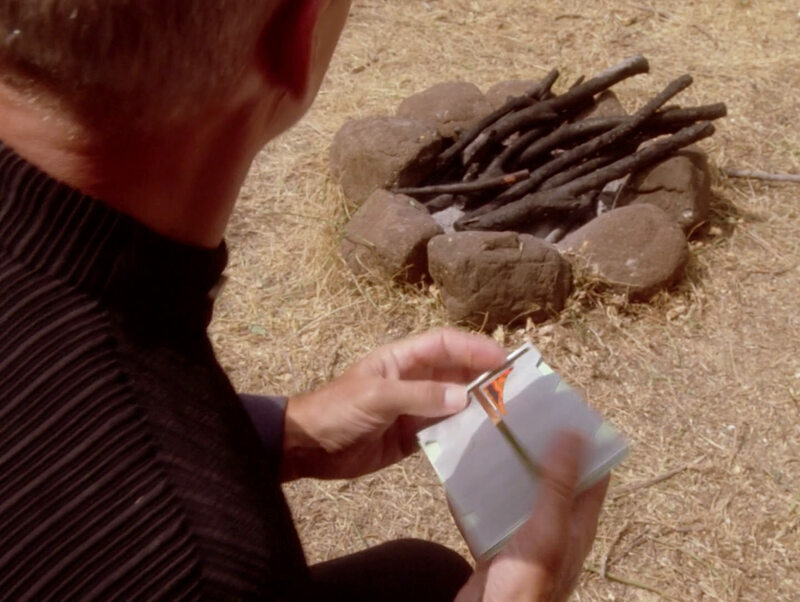 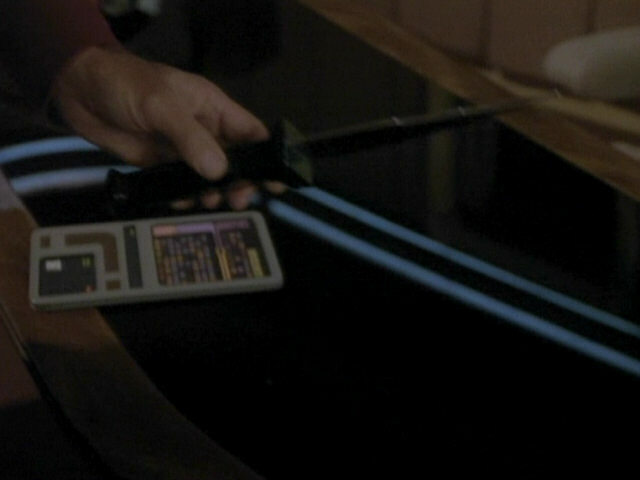 The PADD handed to Picard by Riker seems to feature no legible text. 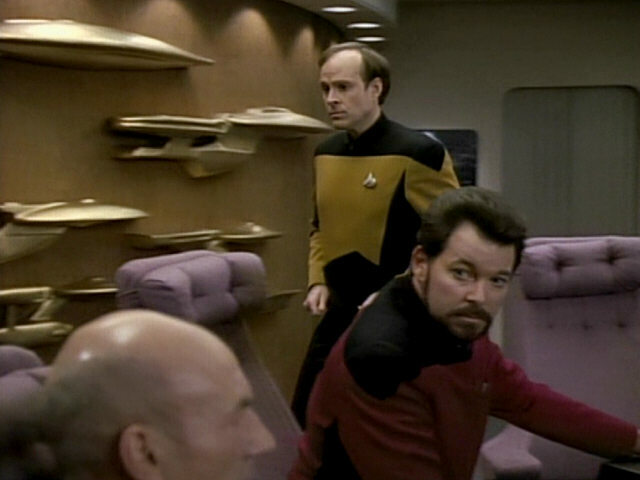 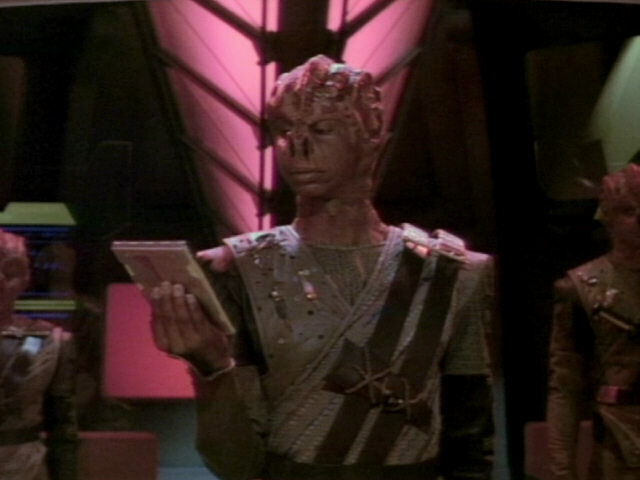 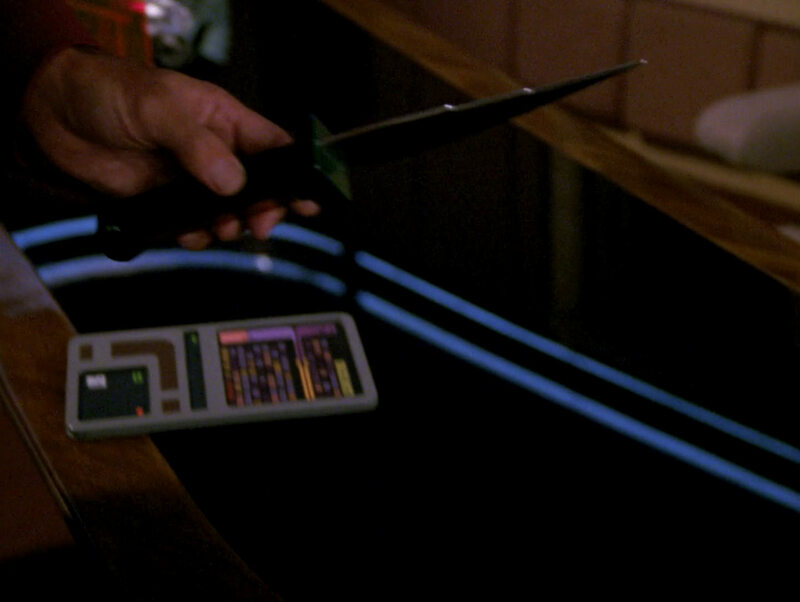 The TNG-R shot confirms that there is nothing useful on the PADD. 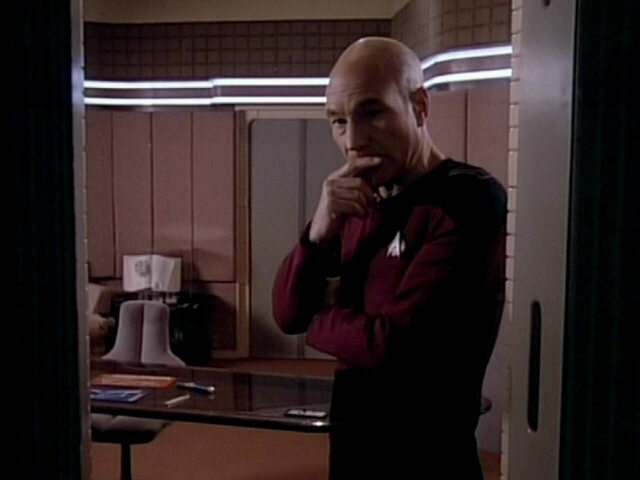 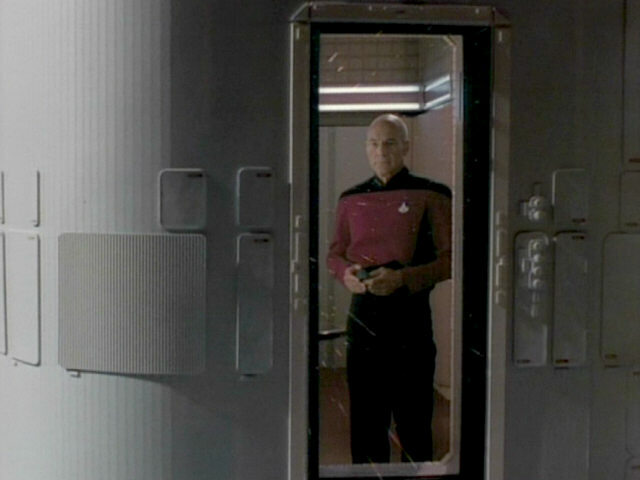 This is one of four episodes in which Picard is seen looking through his ready room window with the camera located outside the ship looking at the captain. 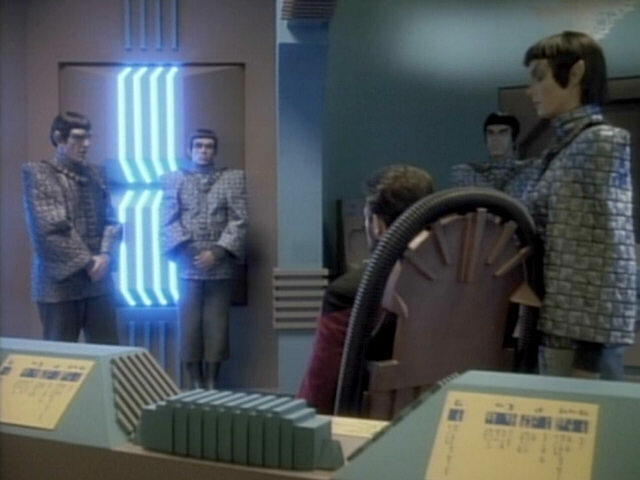 Similar shots appear in "Coming of Age", "The Best of Both Worlds II" and "Conundrum". 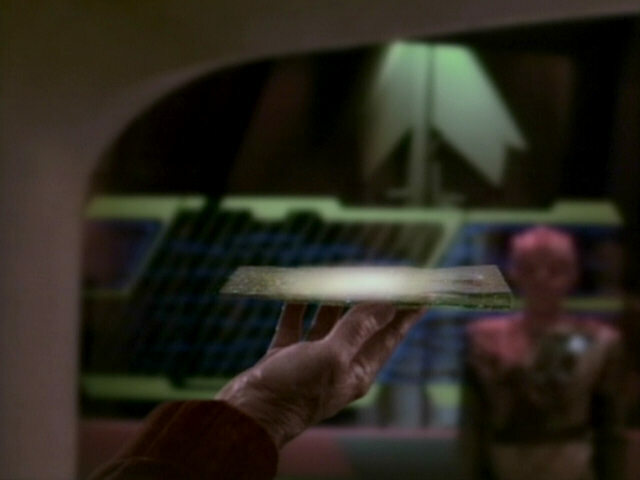 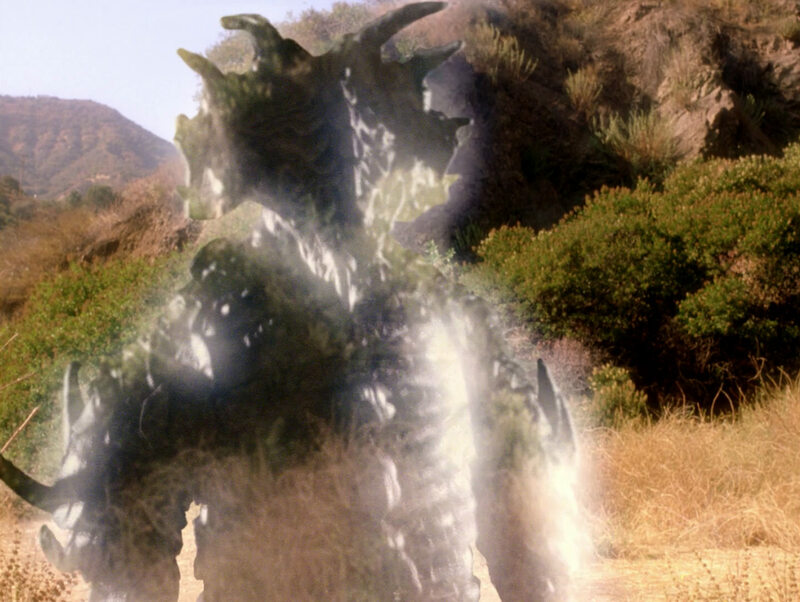 The latter two, and the shot seen in this episode, feature a cardboard model built by Rick Sternbach and Mike Okuda. 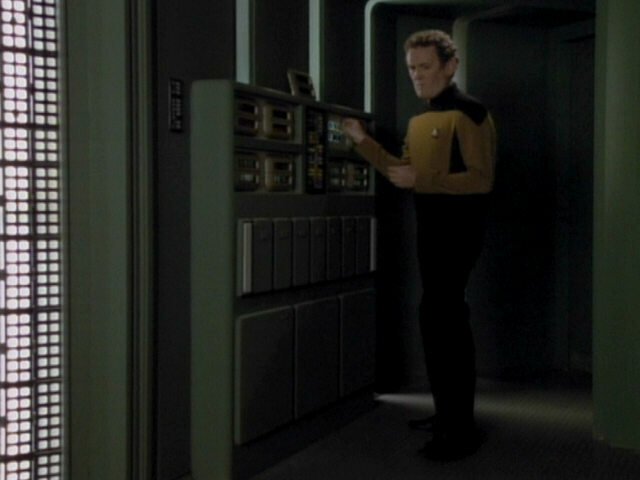 "Conundrum" The great shot in HD.